Thanks to Yumble for sponsoring this post. 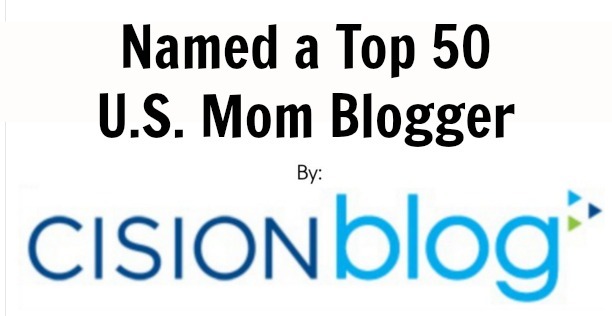 As a busy mom, I’m always looking for things that will help save me time (and my sanity). 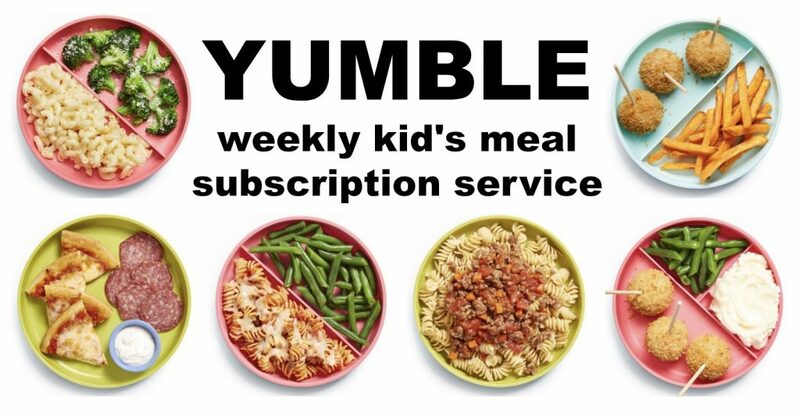 I recently discovered Yumble, a weekly subscription service that delivers prepared, healthy, and delicious kids meals right to your front door. My family has tried the service for two weeks so far and I wanted to share about it because it’s amazing! Since I’m towards the end of my pregnancy, and my husband has been working a lot of late nights, I chose to get 24 meals a week to feed my two boys dinner almost every night and give myself lunches and dinners as well. This made each meal $6.99 which I thought was comparable to other meal plans I’ve seen. My favorite part is that the meals are already made and kept in the refrigerator so they just have to be heated up in the microwave which is something my boys (ages 9 and 10) can do for themselves. Plus, no cooking means no dishes! Another great feature of Yumble is that the subscriptions let you skip weeks whenever you want to which is great because you can take a week off if you’ll be out of town or simply know you’ll have more time to cook meals yourself during certain weeks. Each week Yumble gives you the option to select the meals you want delivered. This is great for picky kids who decide they like something one week and don’t like it the next. I thought there was a good variety of meals and liked that they offered a number of healthier kid-favorites and meals that would introduce them to new foods. Lucas, my vegetable avoider, loved the “veggie tots” not realizing they were made with sweet potatoes and cauliflower! I consider that a win! My favorite meal was the rotini sprinkled with cheese and paired with green beans. Lucas liked the “yes please, mac & cheese” the best and Jacob liked the pizza stackers and pizza pocket the most (no surprise to me that they chose those meals as their favorites!) 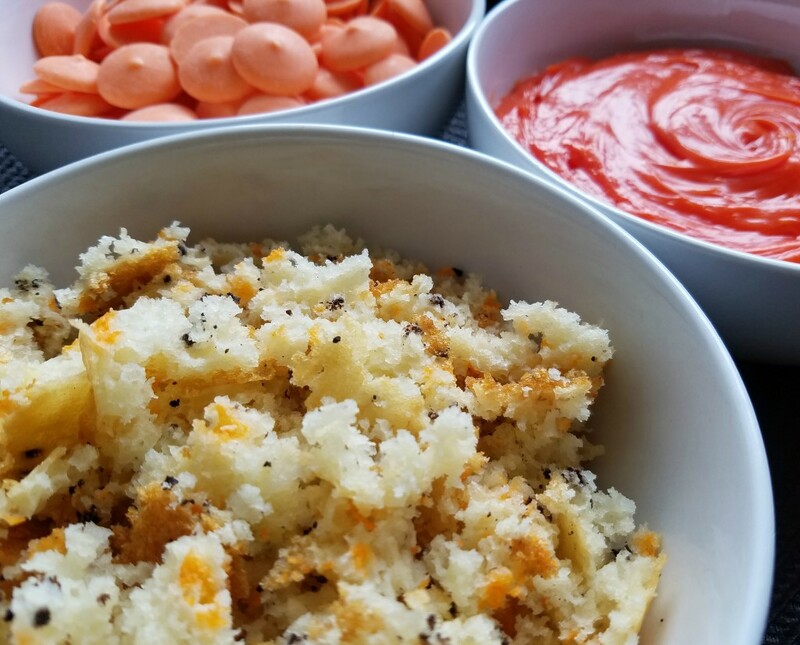 Yumble meals are intended for children ages twelve months to twelve years so, since my kids are on the older end of that spectrum, I worried that there might not be enough food for them but each meal was filling (even as meals for me as an adult). 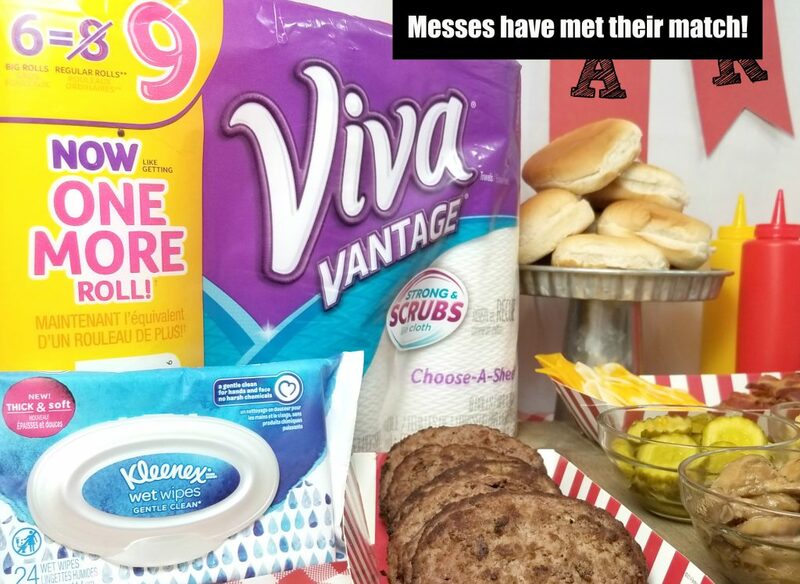 The only thing I would change is in regards to some of their “cold” lunch meals that contained something that should be heated up in my opinion making them meals that could be enjoyed at home but not put in a lunchbox or eaten on-the-go in the car. For example, one of their meals that I loved snacking on for lunch contained sliced cheese and pepperoni with a side of pretzel sticks with honey mustard dip but then had a side of cooked peas and carrots as well. While I guess the peas and carrots could be eaten cold I thought it was a bit odd and I wish the veggie option would have been something else that could be enjoyed cold like maybe cucumber slices or even a dried fruit like apples. Overall though, I’m absolutely in love with this kid-friendly food delivery service. It’s convenient for families and much more affordable and healthier than going through the drive-thru on busy evenings. It’s also flexible (with the ability to skip weeks or change the number of meals you receive each week) which is important! Want to try Yumble yourself? They have given me a discount code so you can get 30% off your first two weeks! Just use the code ‘MakingTimeForMommy30’ on their site. You may have noticed that I didn’t make a New Year’s Resolution post this year. Usually I have a long list of goals that I want to work on throughout the year but this year I decided to keep it simple and really focus on what was important. In years past I had a laundry list of things like “read 10 books” and “save money” and that was great and all (and still things I’d love to do) but this year I have only two things I’m going to focus on- self-care and more family time. For the later, I brainstormed things I wanted to do more of with my kids in 2018 so I thought I’d share them. 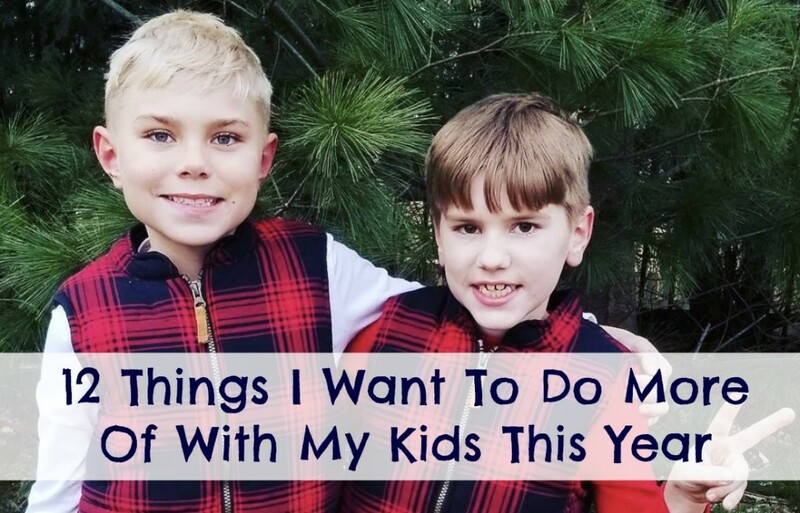 Obviously, “more family time” is really broad but I figured I’d come up with 12 ideas- one for each month of the year- of what I want to do more of with my boys. I want to eat dinner together more often. We used to eat dinner together every night but it doesn’t happen as often as I’d like it to anymore between sports schedules and work schedules. I’ve found that making easy meals, like On-Cor Frozen meals, is the best way to make this happen because they are ready in just minutes. I’ve stocked up on some of our microwave favorites and hearty entrées, like the Macaroni & Cheese, Penne Pasta & Meatballs with Tomato Sauce and the “Selects” Lasagna with Meat Sauce, so I’m always ready for “one of those” nights I’m too busy to cook. I want to travel more as a family. This past year we didn’t go nearly as many places as I would have liked to so I hope to travel more in 2018. Traveling with my family and introducing them to new places is one of my favorite things to do! Hopefully we will visit a handful of places here in the Midwest and take at least one or two longer vacations. I want to have more family game nights. We used to have game night pretty much every Friday so I’d love to get back to that now that the holidays are over. We got a number of new games as well so there are plenty to play. Whether we sit in front of the cozy fireplace or play on our back porch in the warmer months, game time is a great way to start the weekend off right. I want to bake more with my kids. Lucas baked cookies with Daddy on New Year’s Eve and it made him so happy! Though baking can be very messy I think that it’s something that is worth the mess. (Plus warm cookies out of the oven are one of the best things ever.) 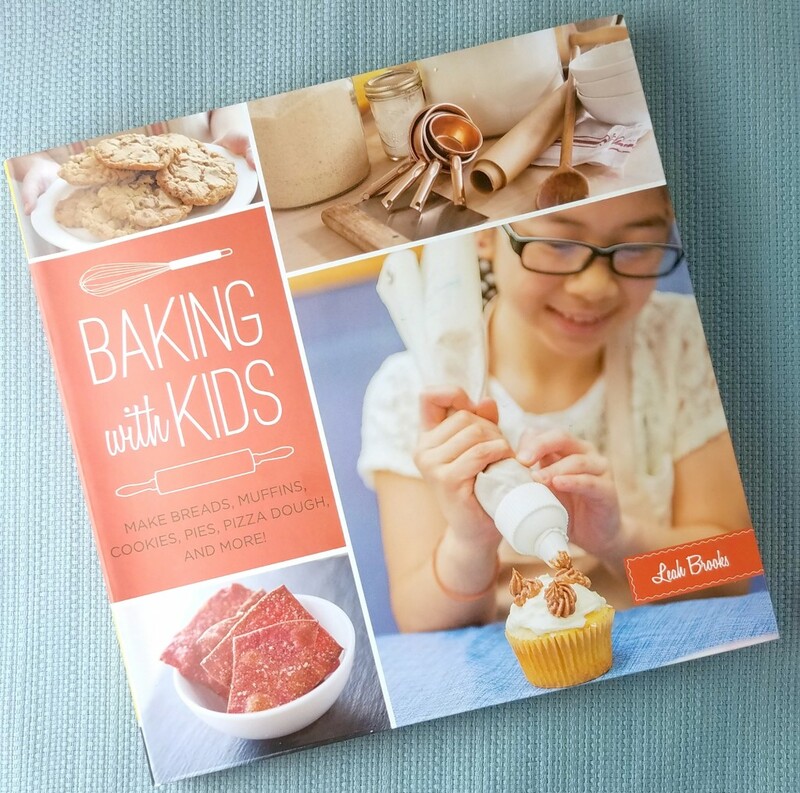 I have a new cookbook with kid-friendly recipes that I can’t wait to make with my kids. I want to spend time together exploring local towns. I want to spend more time doing puzzles together. I love puzzles and the boys do as well. We have a big table in our tv room now that’s perfect for puzzles so I hope to always have a puzzle out that we can work on here and there. I want to go on more family walks. Walking around with no destination in mind is a nice way to spend an afternoon. Whether we are walking slowly down a bike path on a warm, sunny afternoon or exploring the streets of a little Michigan town on a cold, snowy day, it’s nice to just spend time together walking around and seeing what we find. I want to spend more time crafting together. In 2018 I hope to make a lot more crafts together. From decorations to gifts, there is so much that we can make ourselves and I think it would be fun to create things with them. I want to spend more time playing with my boys, especially when they are playing outside. Whether it’s playing tag or tossing around a football, I hope to participate in whatever my boys are playing instead of just sitting and watching them play. I want to spend more time camping. I’ve camped since I was a little girl and last summer I really came to realize all the amazing benefits of camping. There’s just something about being in nature, away from most of our technology, that creates the perfect atmosphere for quality family time making great memories together. I want to read more books together. When the boys were little we read books every day but now that they are older we don’t read together as much. I want to find some good chapter books and read them together, a chapter at a time. I want to spend more time together talking (and truly listening). My boys are getting older and I’m realizing that soon enough they are going to prefer talking to friends over their mom. I really want to practice being a better listener, even when they are telling me hour long stories about stuff they’ve watched on YouTube. There are so many ways to connect as a family and I’m looking forward to a year of rediscovering all of the fun things we have done in the past. What is your favorite thing to do with your family? If you are busy, but still want to make meal time together a priority this year like I do, you’ll want to check out On-Cor’s line of entrées. On-Cor is just a freezer away for an always easy, always satisfying and always ready solution for “one of those nights.” Their frozen, fully-cooked meals are conveniently packaged and ready to heat and serve so you can spend more time making memories and less time in the kitchen. 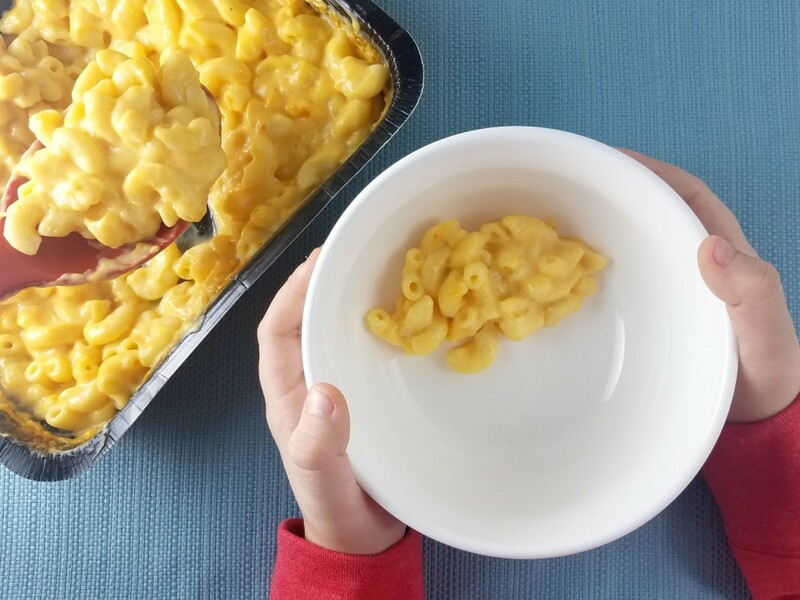 The multi-serve entrée products feature popular flavors and varieties including Macaroni & Cheese, made with 100% real cheese, which is one of our favorites. For your next family meal, head to the freezer aisle of Jewel (or check out the store locator at www.on-cor.com) to pick up one of On-Cor’s entrées. You’ll also want to enter the giveaway because it includes a coupon for a free On-Cor entrée! I’d love to hear what things you love to do with your family and what New Year’s Resolutions you have in the comments below. When I started this blog back in 2008, one of it’s main purposes was to give me a creative outlet and a way to make time for myself. I had just become a mom and spent my days alone with my baby so I needed someone to talk to and my blog connected me with other moms, something I so desperately was looking for. Over the years my blog has turned into something more so I started looking for other ways to make time for myself. Since I’m now a busy mom with two school-aged boys and a business that keeps me busy, my time is limited. Usually my “me” time is confined to 15 minute or half hour time frames. Because of this, I’ve had to come up with a list of things I can do in short periods of time and I wanted to share a month’s worth of those ideas with you all because I know all moms can use a break right about now. Speaking of delicious snacks… Greek Gods Seriously Indulgent yogurt will make you feel like you are enjoying dessert! Made with whole milk and cream, this thick and creamy treat is the best Greek yogurt I’ve ever had. It comes in flavors like tart cherry, lemon and raspberry ginger. You can find Greek Gods Seriously Indulgent yogurt, in the new 5.3 oz. single serving size, at Walmart. For a limited time save some money with Ibotta! 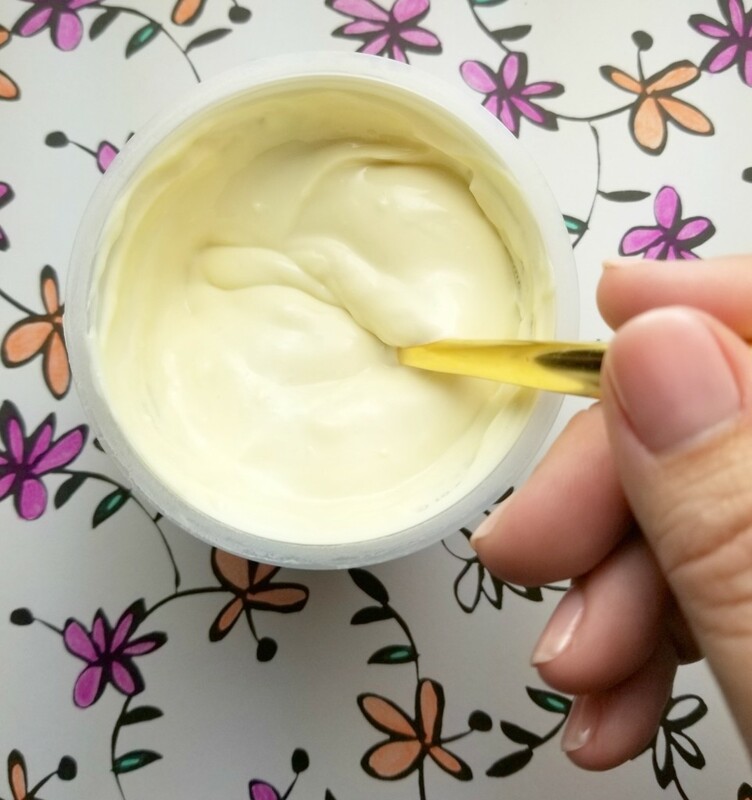 Get $1.50 back on your purchase of 1 Seriously Indulgent Yogurt cup, essentially making this product free. You can redeem up to 2x on the same receipt. There’s also a VUDU movie offer. When you buy 2 yogurt cups you get a $3 movie credit. Just validate your Walmart receipt by uploading it here or texting it to ggvudu@uploadreceipt.com. With these two great offers you can try two Seriously Indulgent Yogurt cups for $3, get your $3 back, and then get an addition $3 VUDU credit. Want more awesomeness? Enter below for a chance to win a $250 Spafinder.com gift card or $150 Walmart gift card. What’s your favorite thing to do during your “me” time? Something you all have probably figured out about me by now is that I’m a fan of easy dinners. I do not like to spend hours in the kitchen and I would literally rather be doing almost anything else than cooking and washing dishes. Because of this, our menu stays pretty simple unless Sinisa is in charge of dinner (so blessed to find a man who actually enjoys cooking). He makes a lot of great meals but they are generally meat & potatoes and I’m more of a pasta girl. Cuddle with my kids on the couch – Let’s face it…eventually my boys are going to be “too cool” for mom cuddles and, at 8 and 9, I fear that time will be here sooner rather than later. So if they want to cuddle I am going to drop what I’m doing and cuddle with them. It’s one of my very favorite things to do! Work on a DIY project or craft – I enjoy working on crafty projects (like this football themed wreath I made) but they can be really time consuming. Making something while dinner cooks in the oven lets me easily multi-task! Help my boys study for their spelling test – Notice I didn’t say “homework” because I’m helpless when it comes to math…. but I actually enjoy quizzing them to prepare for their spelling tests. Take some “me time” to read a book – I love to read and have a stack of books just waiting to be read. I’d much rather lose myself in a good romance novel or get some good tips from a parenting book than stand around in my kitchen. Catch up on that tv series I’ve been watching – I’m a bit of a tv junkie and my DVR is full of shows to watch. I’d love to catch up on the family friendly shows in my queue- like the super hero show my boys and I are enjoying together. Work on a puzzle together – The boys and I love putting puzzles together. We usually have one out that we work on throughout the week whenever we have a spare minute or two. We could get a lot done while waiting for dinner to cook! Beat the next level on my smartphone game – I’m not a huge gamer but I do enjoy a good strategy game. When I find one I like, I tend to want to play it often, especially when I am trying to beat a tough level. Spending a few minutes extra doing this in between folding towels is a fun way to spend time. Read a book to my kids – Since I don’t get much time to read any books for myself, children’s books will have to do! I like to read to my boys and listen to them read to me. They also have to read for 20 minutes each evening as part of their homework so we can do so while dinner is cooking. Play a game – My family enjoys playing games together and we try to do so every weekend but sometimes life gets in the way and we have to skip a game night. Having 30 or so extra minutes to play a game mid-week is a great stress reliever for me and fun family bonding time for all of us! Catch up on work so I can go to bed at a decent hour – I love working from home but the downside is that my work seems never-ending. There is always something else I could be doing- whether it’s a post that needs to be written or an email that I need to respond to. Catching up on work while there’s still daylight means that I can go to bed before the clock is telling me it’s the next day already. What would you do with the time you saved in the kitchen? Would you enjoy a bit of “me” time or spend some extra time with your kids? For your next family meal, head to the freezer aisle of Jewel-Osco or check out the store locator at www.on-cor.com to pick up one of On-Cor’s entrées. There are a number of popular flavors and varieties available, like Macaroni & Cheese, Gravy & 6 Salisbury Steaks, and Penne Pasta & Meatballs with Tomato Sauce – all reasonably priced and made with no added MSG- so you can spend less time in the kitchen and more time doing other things! Our family seems to always be on the go. From guitar lessons to gymnastics to baseball games, I sometimes feel like I spend more time in my car than I do at my house. Because of this, we often end up grabbing snacks as we are running out the door. Over the years I’ve discovered ways to make snacking on the go easier for our busy family so I wanted to share those tips with you all! The most important thing, in my opinion, is to have a variety of snacks for kids to pick from. Some of our favorites are cheddar crackers, grapes, string cheese, raisins, and sliced red peppers. Recently I discovered a new snack called TEDDY SOFT BAKED Filled Snacks that are a hit as well. Kids love them because of their cute teddy bear shape, cookie like taste and soft cake like texture and moms can feel good about giving their kids them because they contain no high fructose corn syrup, no artificial flavors and no artificial colors. Another tip is to keep snacks in a place where kids can reach them. Having snacks within reach makes it easy for kids to help get ready to leave so it’s not all on mom or dad’s shoulders. While I’m grabbing my purse, phone and sunglasses, the kids are grabbing a snack and water bottle. It might seem like a small thing but it’s one less task I have to remember to do before I head out the door. How do you make snacking on the go easier? I’d love to hear your tips! You can find TEDDY SOFT BAKED Filled Snacks in the cracker/cookie aisle at your local Walmart. As a bonus, enter to win Walmart gift cards in the Nabisco Snacktime Sweepstakes below. (Please note: I-C will randomly select 14 winners from all program entries and will facilitate fulfillment of the winning prizes.) Good luck! Thanks to Chef Inside the Box for sponsoring this post. As a busy mom, dinner is one of my least favorite tasks. I am lucky because Sinisa enjoys cooking and is really good at it so he often used to make dinner when he’d come home from work. It was perfect because it was one last thing I had to do but, nowadays, that arrival home time has become later and later and I just can’t justify having the boys eat at 9pm every day so it’s back on my to-do list. When I think about it, I really dislike having to make dinner mainly because it comes right during one of the craziest times of day for us. I often find myself trying to finish up my work day and trying to help the kids get ready to leave for sports while trying to get dinner on the table. Sure I can make meals in the slow cooker but that requires that I think about dinner in the morning and that doesn’t really happen. I don’t usually think about what’s for dinner until it’s actually time to eat and by then using the slow cooker is no longer an option. Another thing I need? Something easy. As much as I love the thought of making a fancy meal for my family, complicated meals with a lot of steps to follow just aren’t for me. This is sadly why I’m not a huge fan of traditional meal delivery services. Yes, the ingredients are portioned out and ready to go but I still have to spend thirty minutes or so in the kitchen following a recipe. Then I discovered Chef Inside the Box, a Chicagoland meal delivery service that not only takes the hassle out of planning and grocery shopping, but also handles the tough prep and cook so you can just heat and enjoy! Most Chef Inside meals contain a few extra servings you can eat for lunch the next day so you are saving time there as well. Even better though? All this extra prep they do doesn’t mean it costs extra. In fact, from what I’ve seen, their cost per serving ($6.95) is less than the other services and shipping is free! Let’s talk meal options. They currently have a small selection but they just started less than a month ago so I’m sure more will be available soon. Right now they only have seven meal options but they don’t require a subscription or commitment so you could just use them during your busiest weeks until the menu grows. They have 10-minute express meals which you only have to heat up in the microwave and then combine (no fresh meal could be simpler!) or regular meals which are ready in about 20 minutes. Each time you order you are required to pick four meals so I chose two regular meals (Braised Beef Fettuccini & Slow Cooked Turkey Risotto) and two express meals (Seared Bourbon and Sweet Onion Chicken & Seared Prime Rib Stroganoff). All of the meals were delicious! The risotto dish was my favorite and the boys loved the stroganoff the best. I felt the portions were large and each meal fed two adults and two kids along with providing at least three or four more servings for lunches or leftover night. Overall, I love this service because it’s cheap and makes meal time so easy. With Chef Inside the Box, I no longer dread making dinner! You can learn more about this Chicagoland meal delivery service here. 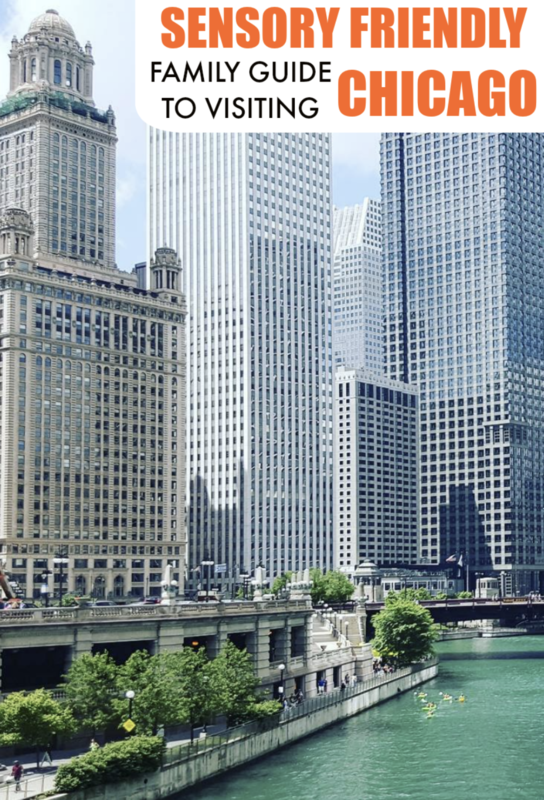 I am always on the lookout for ways to make my life easier so I was really excited to go to Chicago last week for a fun blogger event with Tai Pei. The invite said we’d learn some life hacks along with getting the chance to try some of the meal options from their new line of Asian inspired frozen entrees. Before the event started we had a chance to chat with other bloggers. It was nice to catch up with those who I hadn’t seen in a while and to meet some new people. Every time I think I know all of the Chicago area bloggers I go to events like this and discover I don’t. After a while it was time to eat and I learned we would be sampling three flavors- General Tso’s Spicy Chicken, Beef & Broccoli and Chicken Chow Mein. I like Chinese food but don’t eat it often since takeout tends to be expensive so I was very interested in trying these because I hoped they would be a great replacement. I was pleasantly surprised that they tasted just as good as delivery! All entrees are made with real, quality ingredients and tasted freshly made. The rice is also flavor-infused so each bite is full of flavor. Speaking of flavor, I liked that the General Tso’s Spicy Chicken had a bit of a kick to it but wasn’t too spicy that my kids wouldn’t be able to eat it. Nothing worse than serving dinner and hearing “it’s too spicy” and having the kiddos refuse to it. I don’t think that will happen with these meals! Thankfully I left the event with a couple coupons because I headed right to the store and bought a bunch of them. These are perfect for the days I’m busy working (from home in my pajamas- let’s keep it real here lol) and look up to realize that it’s 2pm and I haven’t had lunch yet. I’ve actually made Tai Pei meals the past couple days and am loving how easy they are. I just heat them up for 4-5 minutes and then eat them right out of the container, which means no dirty dishes to wash.
Want to try Tei Pei single serve Asian inspired frozen entrees for yourself? Get a coupon here! Thanks to Revolution Foods for sponsoring this post. When it comes to simplifying life, one of the biggest areas I try to simplify is meal time. I look for recipes that don’t need a lot of ingredients and things that are easy and quick to make. I’ve discovered that if I try to get fancy with mealtime I typically end up running out of time to make the meal and then claiming it’s “breakfast for dinner night” or going through the drive-thru because that’s all we have time for. 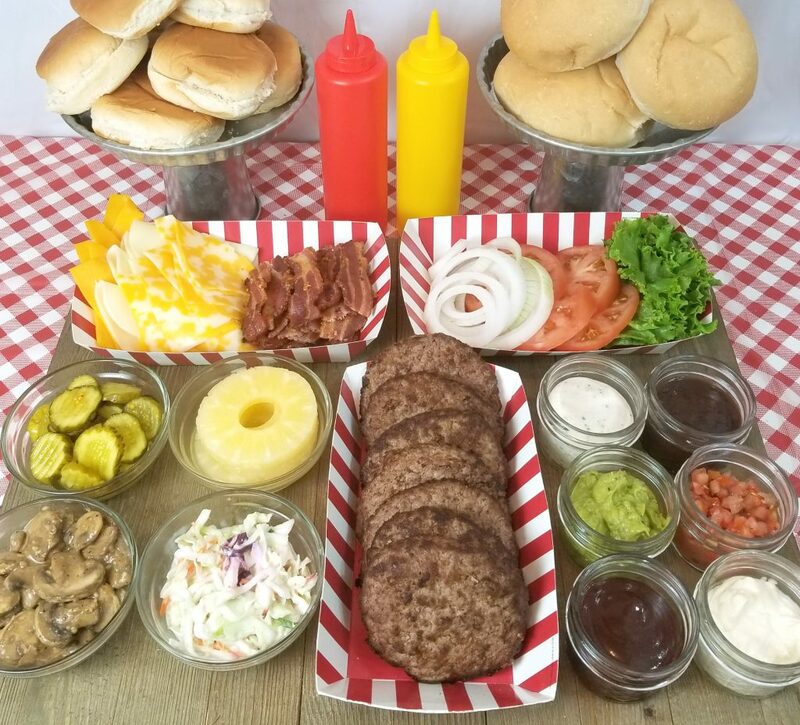 A lot of time, simple and easy to prepare also means “not the healthiest” but Revolution Foods challenges that with their line of convenient, healthy solutions for breakfast, lunch and dinner. The dinner meals contain over 40g of whole grains and have no artificial colors or flavors. The culinary flavors help expand kid’s palates and the flavors are a hit among parents and kids alike. Best of all, these meals are a great solution for busy families because they’ll help you serve a hot, healthy meal in 30 minutes. The speed-scratch cooking kits come in four flavors (Sesame Garlic, Coconut Curry, Smoky Tomato and Fiesta Taco) and contain everything you’ll need to make the meal- just add a protein! The cookbook style cooking instructions are inside the box flap and are easy to follow. Three steps and you’re a dinner hero. First, cook the grain blend. Second, sauté your protein. Once thoroughly cooked, add a punch of flavor with the Hero sauce packet and chef crafted spice blend, Third, spoon into four bowls and serve with a side of your favorite veggies. The first kit we tried was the Smoky Tomato flavor that we added sausage to. I’m going to be honest- my boys aren’t huge fans of quinoa so I wasn’t sure what they would think of the brown rice and red quinoa blend that was a big part of this meal. Surprisingly though, they liked it. (At one point Lucas was even scooping it into his mouth!) The flavor was great as well. It wasn’t too spicy for the kids but it was flavorful enough that the adults didn’t have to add any seasonings to it. These meals are definitely a hit and something I’m going to keep in my pantry for busy days. Find Revolution Foods’ Dinner Hero speed-scratch cooking kits near the boxed mac and cheese at your local Jewel-Osco store. Which flavor would you try first? Years ago a friend was giving away some diet food she didn’t like and I excitedly took it off her hands. I remember taking a couple bites of the first meal and thinking that it was literally one of the worst things I had ever tasted. It was dry and bland and I wondered why anyone would torture themselves with food like that. If that was “diet food” then I wanted nothing to do with it. Then, this year, I tried Personal Trainer Food and was surprised to find that diet food could actually taste great. Personal Trainer Food is a diet delivery service providing pre-portioned, nutrient-packed frozen meals straight to your door! The food is protein-packed, filled with good carbs, healthy fats and no fillers! You can choose the delivery plan that fits your goals and lifestyle best. From REV! 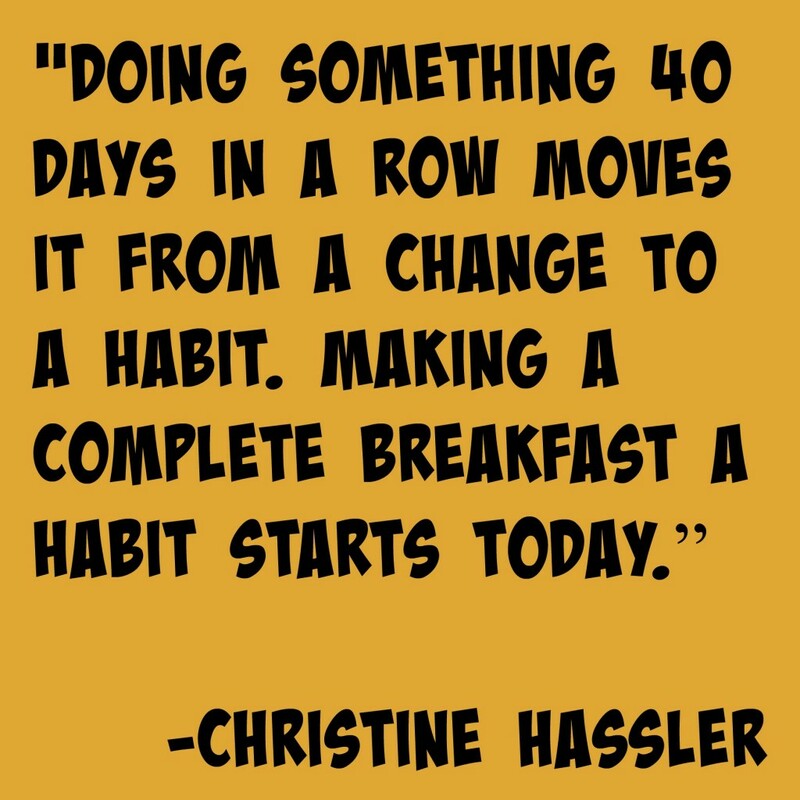 for rapid weight loss to the 14-day 2 meals/day program that gives you the flexibility to make your own breakfasts and some lunches and dinners. I love that Personal Trainer Food makes life easier. Since the meals are delivered right to my home it saves me time and money at the grocery store. Also, because everything is pre-portioned and stored in the freezer, meal time is simple. It’s as easy as picking out a protein and a veggie, heating them in the microwave according to the time on the packages and dumping them on to a plate. Best of all though? The food tastes good so you’ll actually want to eat it! There are over 75 restaurant quality menu items which means you have an almost endless variety of meal options. For breakfast I enjoyed the frittata and omelets with maple sausage. My favorite protein items were the meatballs, bacon & cheese chicken sticks and all of the chicken options. Personal Trainer Food even makes vegetables delicious with their line of sauces you can add to them like my favorite, garlic butter sauce. If you are looking for an easy way to eat healthier, I highly recommend Personal Trainer Food. Now through Friday, 6/9, save 20% Off Any Meal Program + 28 Free Snacks using the code ’20SNACKS’. Learn more about Personal Trainer Food and order here. Our family loves OREO cookies so I always make sure to have a package or two in the pantry. It’s one of the only cookies that everyone in our family likes but what is funny is that we all eat them differently. Lucas loves to twist the cookie into two and lick off the white cream filling while Jacob likes to take bites of the cookie so he gets a bit of the cream filling and the chocolate cookie in his mouth together. I love to crumble mine up into pieces as a topping for chocolate pudding so I can slowly enjoy the chocolate treat while Sinisa sticks the whole cookie in his mouth and eats it in one bite. It’s also fun to dunk our OREO cookies in milk! There are dozens of ways to dunk OREO cookies, including OREO Cookie’s tried-and-true dunking techniques – the Twist & Dunk, the Double Dunk, and the Plunge. Personally, I like to break mine in half before dunking it. Sinisa and the boys prefer to use a larger glass and dunk the cookie in one fell swipe. OREO cookies wants to see how everyone dunks their cookies and are asking people to visit Walmart to pickup OREO cookies and then post their dunking technique with #OREODunkSweepstakes on Instagram, Facebook and Twitter. Those that do will be entered to win! 40,000 lucky finalists will have a chance to win one (1) of five (5) VIP Grand Prize trips to a Celebrity Dunking Event in NYC or Los Angeles, plus $2,000! Learn more here. How do you dunk your OREO cookies? As a busy mom, I am always on the lookout for easy meals. Typically this means we are stuck with quick pasta dishes and chicken, but I’ve recently discovered a new line that lets me add a little bit of Mediterranean flavor into our menu rotation. Wild Garden’s ‘Taste of the Mediterranean’ line features three all natural ten-minute Marinades and three 90-second heat and serve Pilafs. The Marinades come in three flavors- Shawarma, Turkish and Persian. I love that all of the spices are mixed together and come in a convenient pouch. Just dump, mix with meat and let sit for 10 minutes and then the meat is ready for the grill, skillet or oven. The meat can then be enjoyed as kebabs, put in pita bread as wrap ingredients or used to top your favorite rice. The Wild Garden website has some recipes and we loosely followed one for wraps. We used the Shawarma marinade to flavor steak and then put them on flatbread with tomatoes, onions and feta cheese. I topped mine with Tzatziki sauce and Sinisa enjoyed his wraps with hummus. We are looking forward to trying the Turkish marinade to make kebabs, one of Sinisa’s favorite foods. The pilafs are the perfect dinner starter or side for an entree. They come in three varieties- Rice & Lentil, Bulgur and Couscous. These products are sure to become a family pantry favorite because they are so easy to heat in their pouches. I really loved the rice and lentil one. Not only was the flavor great but I like that it has caramelized onions mixed in. Do you make Mediterranean dishes at home? Which is your favorite? If you are as busy as I am, you are probably a fan of quick lunch options. Personally, I tend to gravitate towards frozen meals because they are the easiest to make and I can multitask while they are cooking. I can stick them in the microwave, go throw in a load of laundry and in minutes I have a hot lunch that’s ready to eat. My favorite frozen meals are Lean Cuisine ones. I love that they have always had such a great variety of meals, whether I’m in the mood for a meat filled dish or craving pasta. They are full of flavor and always taste freshly made. I like that Lean Cuisine offers product options that are non-GMO, gluten-free, and high in protein. Some options are even made with organic ingredients (like the LEAN CUISINE® Marketplace Vermont White Cheddar Mac & Cheese that’s made with organic pasta). While the Lean Cuisine meals are perfect on their own, I sometimes will make a side dish as well. Some days it’s a salad or fresh fruit, but I also like to make a quick veggie sauté on days I have a bit more time. My zucchini and squash sauté is the perfect side for the Vermont White Cheddar Mac & Cheese. The best part about this veggie sauté is that it’s super simple and easy to make. I’m not a huge vegetable eater but I’m working on eating more fruits and vegetables and this is a great way to do it. I always make sure to have some zucchini and squash in the fridge because I make this dish at least a couple times a week for lunches and dinners. Slice your zucchini and yellow squash into pieces about 1/2-1 inch thick. (For faster cooking time you can cut the pieces in half lengthwise also to make them smaller.) Add the oil to your pan or pot and let it heat up on the stovetop. Once hot, add your zucchini and squash and then sprinkle on the garlic and seasonings. sauté the vegetables on low to medium heat, stirring often. Continue cooking your vegetables, stirring every couple minutes, until your zucchini and squash pieces are cooked all the way through. You’ll know they are done when you can easily stick a fork through them. These vegetables are perfect with the Lean Cuisine white cheddar mac & cheese. The vegetables are savory and a bit crunchy which pair well with the creamy mac & cheese. My other favorite meal is the LEAN CUISINE® Marketplace Butternut Squash Ravioli that I was excited to discover a few years back. It reminds me of Thanksgiving each time I eat it! When I was at Target this weekend I found that all the Lean Cuisine meals are on sale for only $1.99 (through 1/31) so it’s the perfect time to stock up on them. With their variety of flavorful meals you could try something new every day for weeks. What is your favorite lunch to enjoy on busy days? I’ve recently written about my journey to get healthier, from exercising more to drinking more water to making better food choices. I’m working on becoming a healthier version of myself. One thing that I’ve been trying to do is making sure that I eat lunch every day. I used to skip lunch because I was so busy working but I’ve been making a conscious effort to stop and take a moment for myself to eat. My days may be busy but I’ve found healthier options available at my local Jewel grocery store- MorningStar Farms® Veggie Bowls. 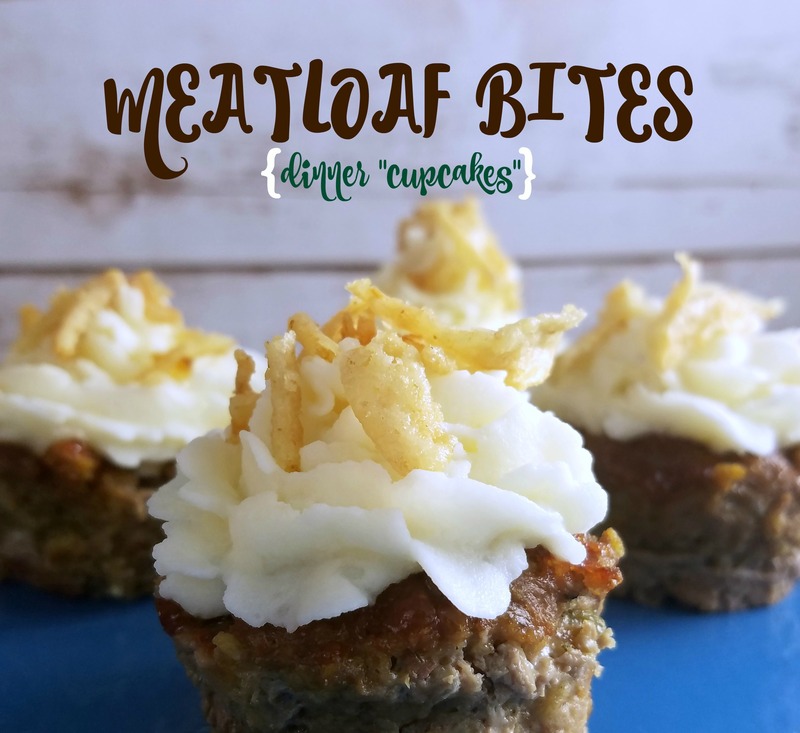 Found in the freezer section, they are a convenient option for lunch because they are easy to heat and eat as-is when I’m in a hurry, which is pretty much every day during this holiday season! I like to take a bit of time out of my day to enjoy a nice hot meal and just sit and relax. Being able to get my veggies in while doing so- nothing is better than that! These Veggie Bowls are not only for vegetarians—they are for anyone who wants a quick meal with lots of flavor. Their CHIK’N POT PIE Veggie Bowls are filled with 100% vegan chik’n strips and lots of vegetables. They even come with a biscuit! I also liked the Italian Sausage Bake Veggie Bowl, made with Veggie Sausage Crumbles™, that I tried. To make lunches even better I decorated a special lunch tray for myself. I’m including instructions in case you want to put one together for yourself! Paint your wooden tray in any color you’d like. I kept it simple by painting it white. Once you let the tray dry (I let mine dry overnight) it’s time to decorate it. I used beautiful gold foil stickers to add some shine to the corners of my tray. Do you take a break from your busy day to enjoy a hot lunch? If so, have you tried these new Veggie Bowls? This is a sponsored conversation written by me on behalf of Barilla® and Johnsonville®. The opinions and text are all mine. During the fall I love finding easy, hearty dishes for my family. Sinisa recently made this delicious, one pot Italian meal and I just had to share it with you all. Not only is it fantastic because you only use one pot to cook everything, but it’s affordable, too! Get a medium to large sized pot and add enough cooking oil to coat the bottom of the pot. Cut the Johnsonville Mild Italian Sausage Links into bite size pieces. Add your onions and sausage to the pot and cook them until meat is thoroughly cooked. Add crushed tomatoes and broth to the pan. Then add mushrooms, Barilla Pasta and seasonings. Pour cream over the top and then stir well. Simmer on the stove top for 20 minutes, stirring occasionally. Your whole family will love this meal and you will love how easy it is on your wallet, costing less than 10 dollars. And cleanup is a snap. You can find all of the ingredients you need for this meal at your local Kroger store, including the Johnsonville Mild Italian Sausage Links and Barilla Blue Box Pasta. Pasta dishes are some of my favorite dinners to make, and I always have Barilla Blue Box Pasta, Italy’s #1 brand of pasta, stocked in my pantry. Pasta is perfect for busy nights and those last-minute dinner guests that come over before you can get to the grocery store! There are so many varieties of pasta dishes that you can make and you can personalize the dishes to your family’s likes and dislikes. When we add meat to our pasta we often choose Johnsonville Mild Italian Sausage Links. They don’t require any additional seasonings which makes them convenient and flavorful additions to any pasta dish. We usually add them to our spaghetti, but Sinisa also likes to put the sausage in some soups he makes as well. What are your favorite pasta dishes to make in the fall? With the nights getting even busier as the school year continues, I’m trying to add more easy recipes to my menu plan. I normally make meals in the crock pot that cook while I work. 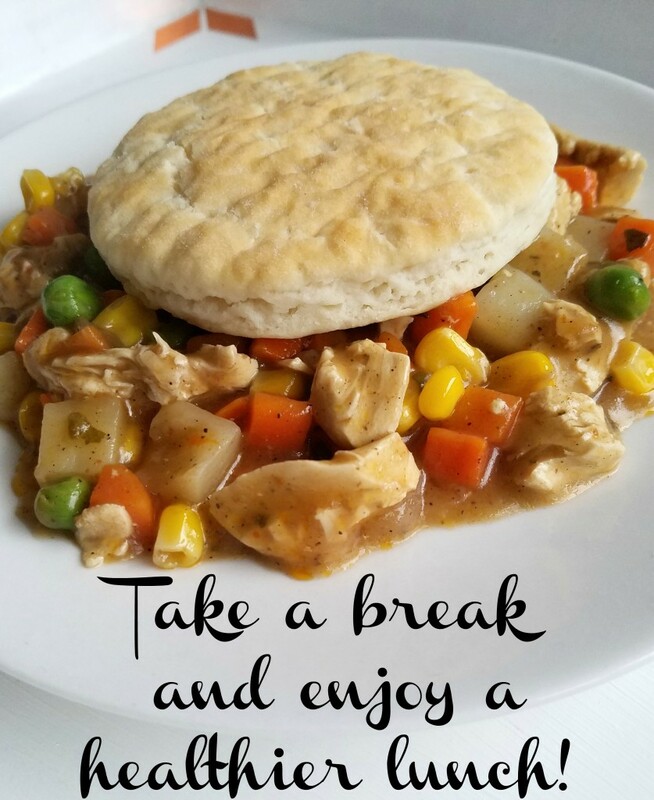 But sometimes I don’t start thinking about dinner until after I’ve picked the kids up from school, and by then it’s too late to throw something in the slow cooker. Thankfully I’ve discovered the best recipe for nights like that- Hawaiian Pork Sliders! 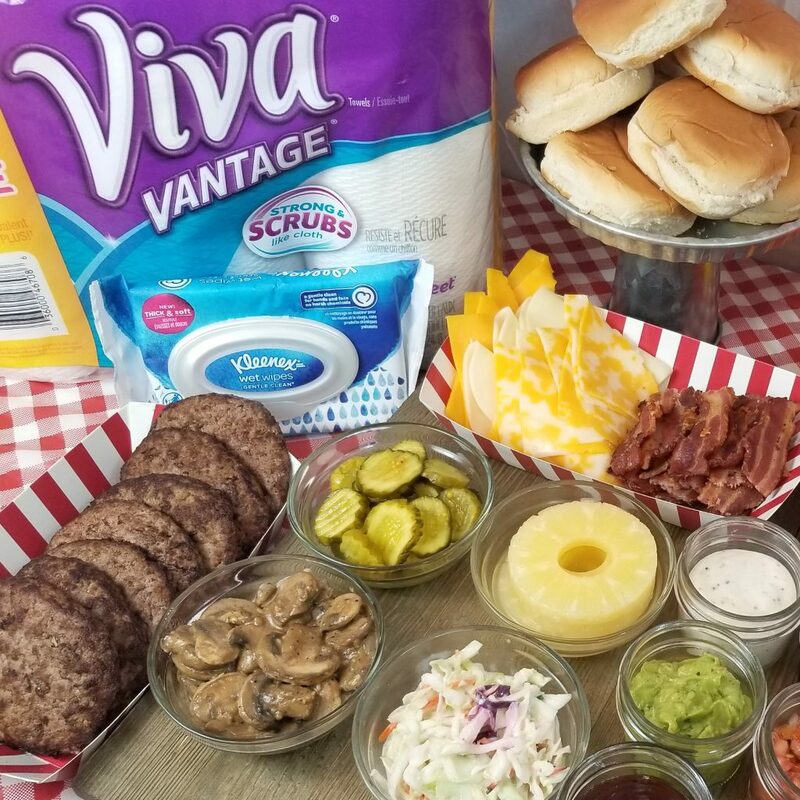 These sliders can be made with less than 15 minutes of prep time which make them perfect for dinner on busy school nights. 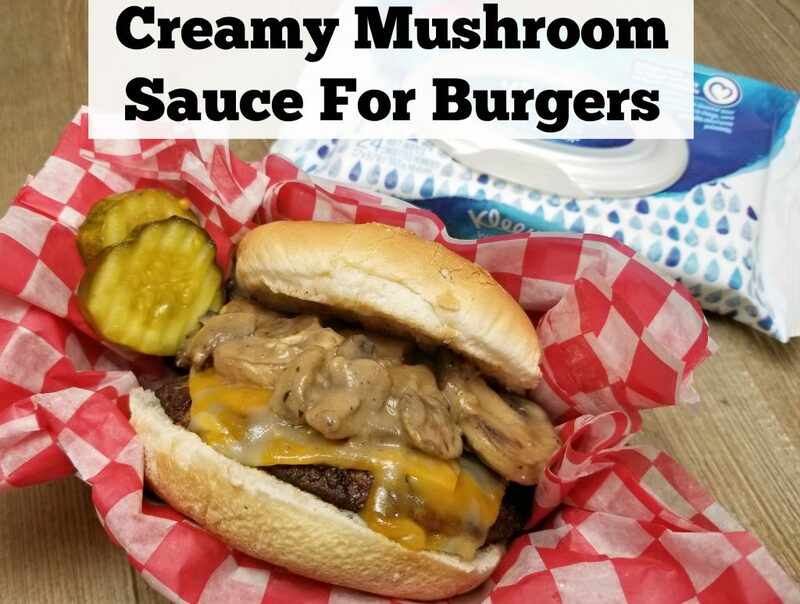 They are also a great lunch recipe because you can whip them up quickly before sitting down to watch the football game on Sunday afternoon with your friends and family. I also like that any leftovers can be enjoyed the next day for lunch either as a sandwich or even recreated into Hawaiian Pork Fried Rice. Since I’m really focusing on making sure that I don’t skip lunch it’s always great to have some leftovers in the fridge, and pork is such a versatile ingredient. To make the sliders I used Smithfield Marinated Sweet Teriyaki Pork Tenderloin. The pork comes already marinated so it didn’t need any additional flavoring or spices added to it which makes busy nights easier. This also helps keep the ingredient list for this recipe low. 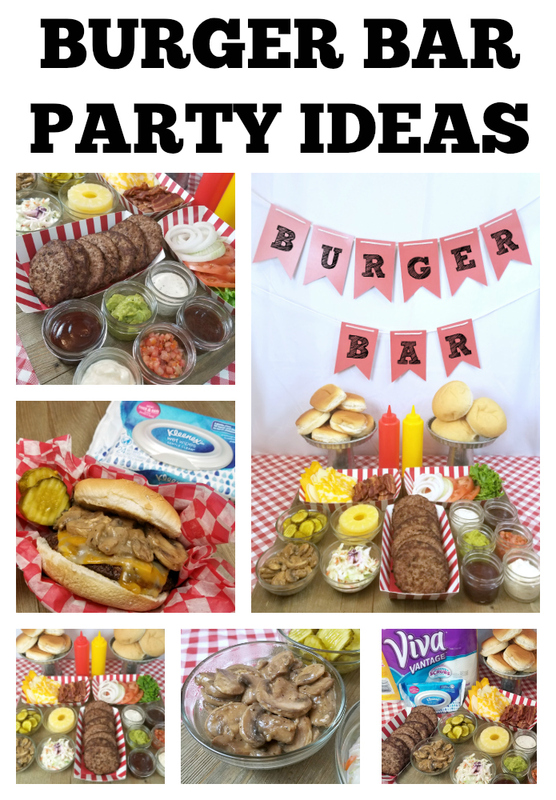 All you need to create these delicious sliders are four ingredients! Take the pork tenderloin out of the package and slice it into ½ inch thick slices. Lay the slices out onto a foil covered pan and cook the pork in the oven for 30 minutes at 450 degrees F.
While the meat is cooking you can sauté the pineapple in a sauce pan. Start with a hot pan and cook the pineapple slices for one minute on each side. Once the pineapple and pork are cooked you are ready to assemble your sandwich. Cut a roll in half and on the bottom piece set a couple pieces of pork, a pineapple slice and a drizzle of barbecue sauce, then top with the other half of the roll. Hope your family enjoys these sweet Hawaiian Pork Sliders! 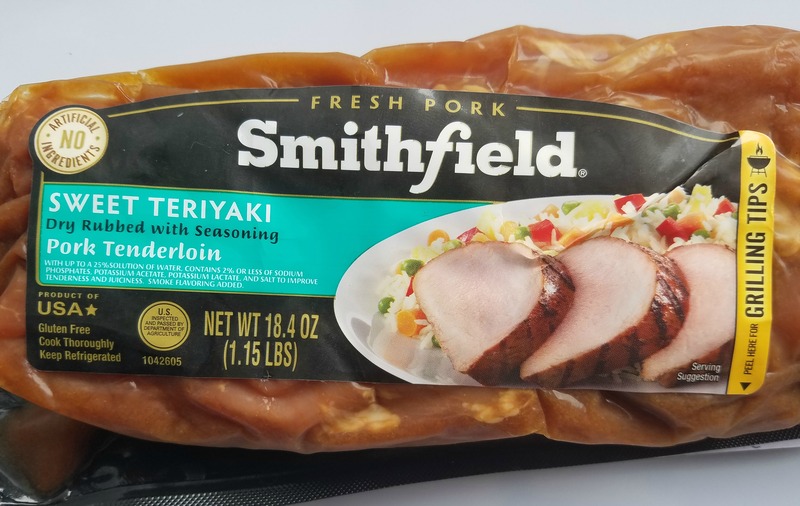 You can find Smithfield Marinated Fresh Pork products at your local Kroger store in the refrigerated cases of the meat department. While at the store, we also bought the Smithfield Marinated Roasted Garlic and Herb Pork Tenderloin. I’ll be putting that in the slow cooker tomorrow with some potatoes and carrots so we can come home from sports practice to a hot, home cooked meal. 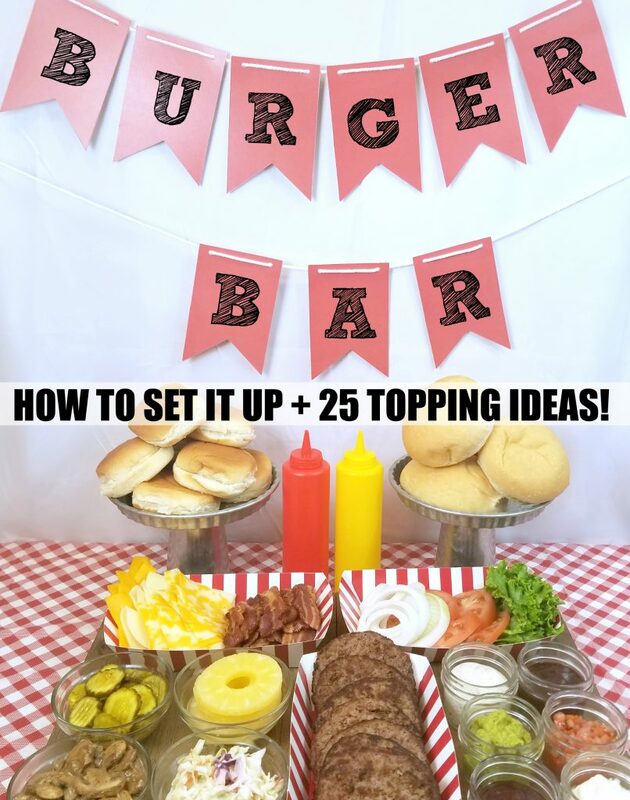 Need more meal ideas? Visit Smithfield for recipes you can make on busy school nights. 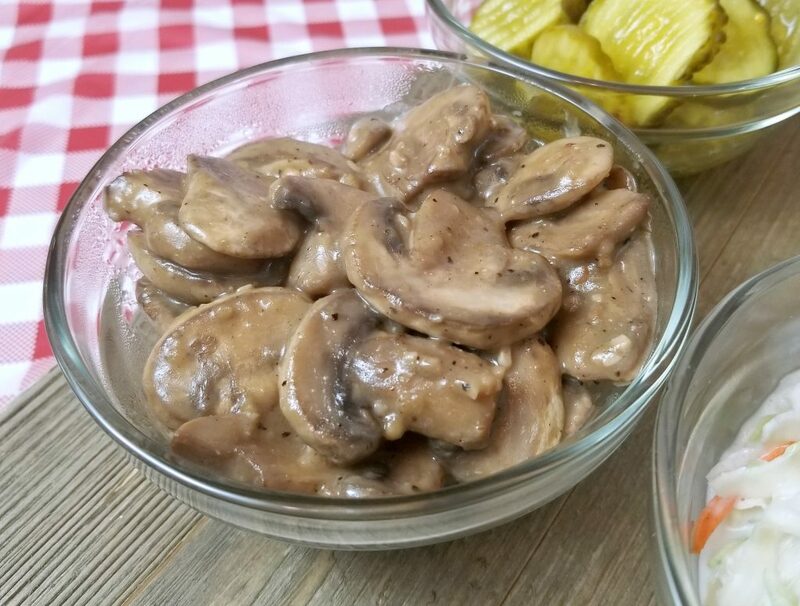 Their #RealFlavorRealFast recipe index has a bunch of great ideas including Veggie-Stuffed Pork Loin with Creamy Mustard Sauce and Filet Mignon Pork with Buttery Mushrooms. Those sound delicious and are perfect for busy nights because both can be made in 30 minutes or less. They look so fancy, though, and your family will think you slaved all afternoon in the kitchen! Instead, use that time saved to play a new game with your kids, curl up on the couch with a good book or go out to lunch with your friends. You deserve it, Mom! What Real Fast recipe do you want to try first? I’ve been seeing lots of pictures in my Facebook feed of all my friends at the pumpkin patch with their kids and I can’t wait to go pick pumpkins with my boys this year. I thought it would be fun to make some pumpkin mini cakes to celebrate this wonderful time of year (and the fact that fall temps are coming to Chicago this week)! Make your cake mix according to the directions on the box and let cool. Crumble cake mix into a large bowl. Add in one can of frosting and stir together. Form into teaspoon size balls and place on a wax paper covered cookie sheet. In a separate bowl, melt candy melts according to the package. Using a fork, dip cake balls into the melted chocolate and place on a cookie sheet. Cut a tootsie roll in half and place on top of the cake ball in the middle. I chose to use a Funfetti cake mix with Halloween sprinkles for my cake bites but you can make them with any cake mix you’d like. 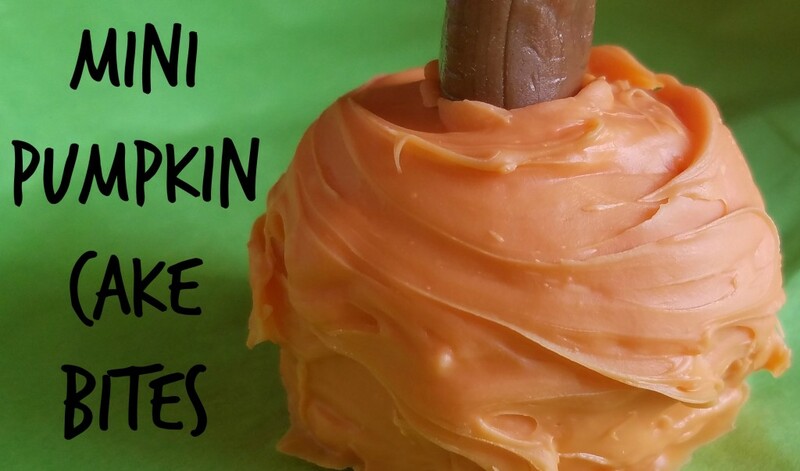 I think a pumpkin flavored cake mix would be fantastic in this recipe. Butterscotch haystacks are one of my favorite cookies and one I make often because they are so easy to make. 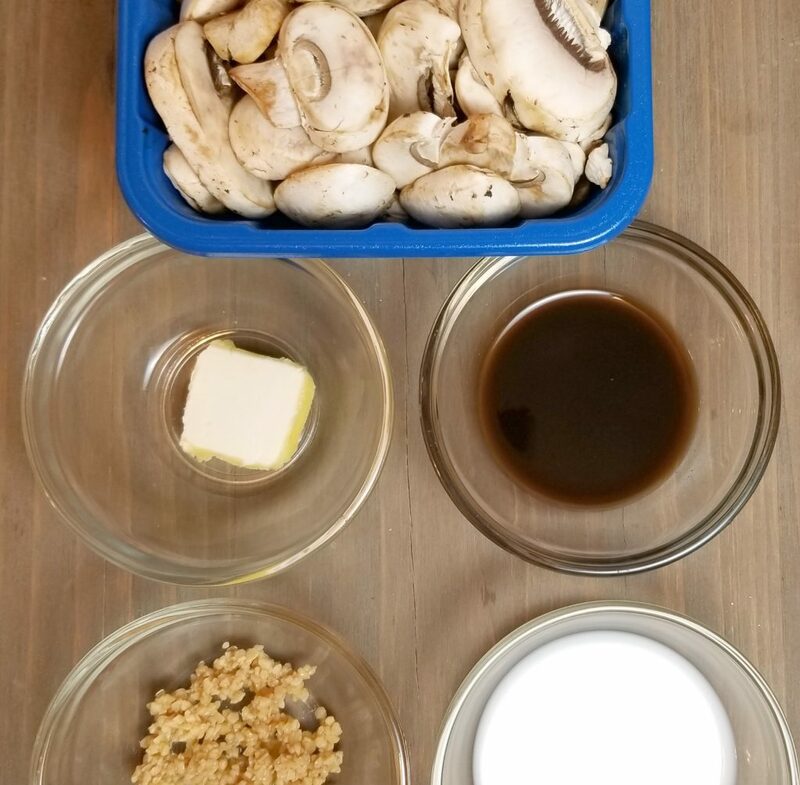 These no-bake cookies only need a few ingredients and, while the inclusion of noodles in this cookie may make you question them, they really taste delicious! They are also versatile. I first shared the recipe for them on my blog in 2010 as a Christmas treat idea. Then this past March made them into nests topped with PEEPS for an Easter treat. Now I’m transforming them into the perfect fall treat by adding a Halloween candy staple to them. Drop a tablespoon of chow mein mixture onto a baking sheet lined with wax paper and repeat with the remaining mixture. Top each haystack with a few candy corn. Refrigerate until the haystacks harden, about 30–60 minutes and store in an airtight container or plastic bag. 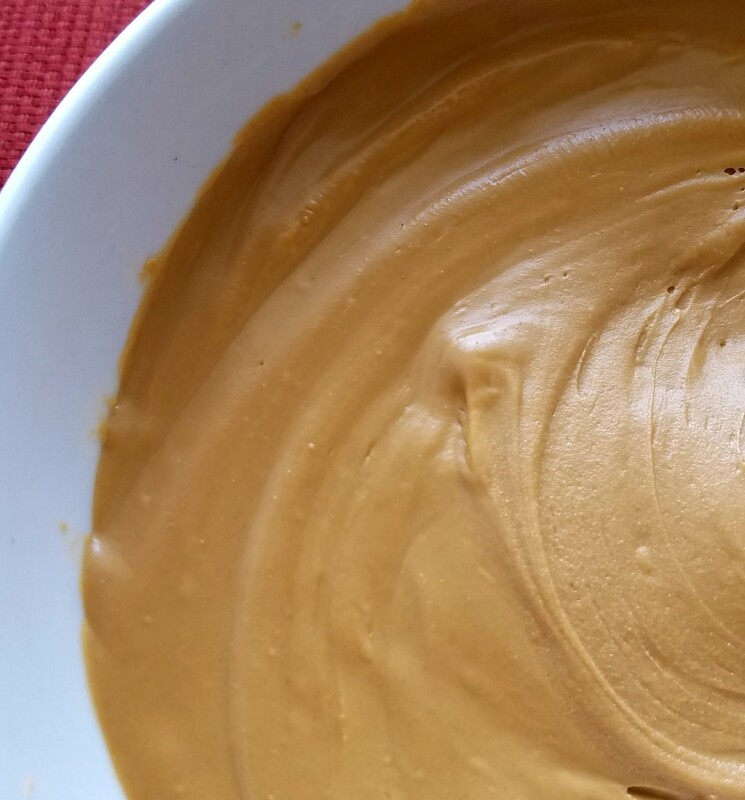 It’s amazing how the crispy, kind of salty flavor of the chow mein noodles mix with the butterscotch and peanut butter flavors to form one sweet Halloween treat. Hope you all enjoy them! 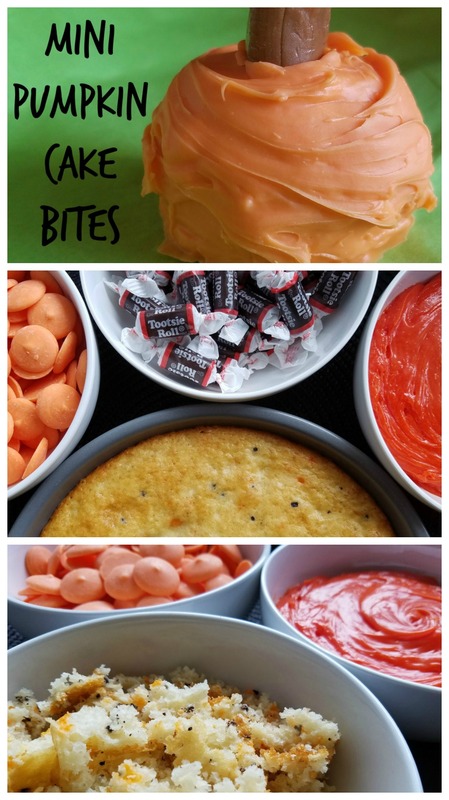 Looking for a super easy snack for Halloween parties? 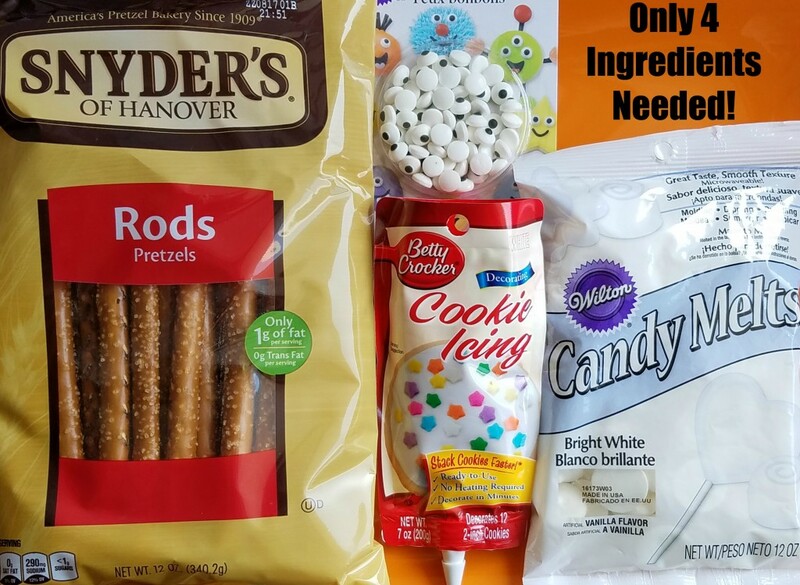 These Mummy Pretzel Sticks take less than 10 minutes to make and can be a fun afternoon activity for children to help with. Kids (and adults!) 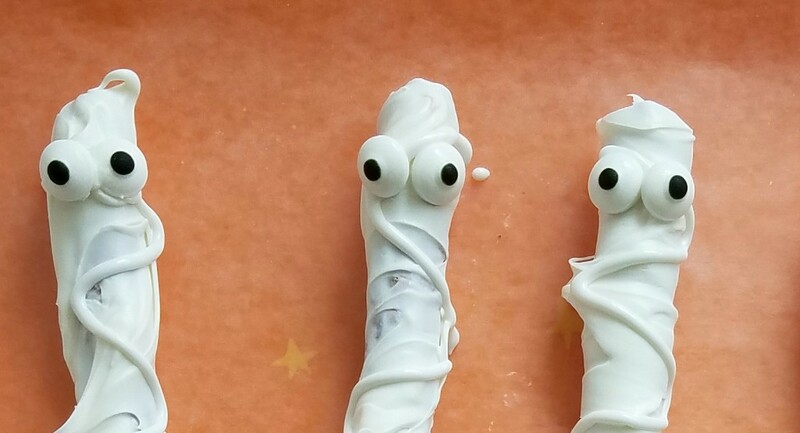 will love these spooky treats. Aren’t these fun?! What’s your favorite Halloween treat? I shared last month about the fall harvest snack mix I made that was a big hit with my kids. I wanted to share three more snack mixes that I made, all with flavors that bring back memories. I made an “apple pie” snack mix, “pb&j” snack mix and “banana split” snack mix. The best part is that all of the snack mixes are super easy to make. You simply take the ingredients and put them in a bowl or plastic bag and then stir or shake them up together to mix them. They can be packed in lunch boxes, enjoyed as an after school snack or eaten on the go as you head to scouts or sports practice. The first one I made was a PB&J snack mix. This snack mix is made with only three ingredients and tastes just like a peanut butter and strawberry jelly sandwich. The next one I made tasted just like one of my favorite desserts- apple pie! Again, this mix was made using only three ingredients (with an option of adding more cinnamon flavoring if you’d like). The last snack mix I made for my boys was their favorite and understandably so! I made them a banana split snack mix complete with chocolate and marshmallows. I win mom of the year over here! All three of my snack mixes were made using our favorite cracker brand, Goldfish crackers! I never realized that there were so many varieties to choose from. Since we use Goldfish crackers often for lunches and snacks I chose to buy two of the large variety boxes when I was at Walmart. Luke’s favorites are the Cheddar flavor and the Vanilla Cupcake flavor and Jake loves the Flavor Blasted® Xtreme Pizza and Flavor Blasted® Xtra Cheddar flavors. Of course, each snack mix was paired with fresh fruit from the produce department. I chose to pair the PB&J snack mix with strawberries, the Apple Pie snack mix with apples, and the Banana Split snack mix with bananas. It’s always nice to enjoy fresh fruit as a snack! If your family enjoys Goldfish crackers as much as mine does you will want to stock up on Goldfish snacks at Walmart because the bulk boxes are currently on rollback for $5.98 a box. There is also an additional deal in store where you can save $1.00 on any ONE (1) Bolthouse Farms® 10 oz. Baby Carrots or Bolthouse Farms(® 11 oz. juice when you buy any ONE (1) Pepperidge Farm® Goldfish® crackers 30 oz. or larger. What snack mix would you make with Goldfish crackers? Lunch has always been a meal that I tend to skip because I’m so busy working that I forget to eat. I’ve started making “eat lunch” an appointment on my calendar to remind myself to take a break and eat something. Since I only have about 15 minutes or so to eat I try to make things that are easy and quick. Today I chose to make myself a chicken bacon ranch salad wrap for lunch and it was so delicious I had to share it with you all! This lunch was filling and delicious. I love Litehouse’s Chunky Blue Cheese Dressing but had never had any of their ranch dressings before. 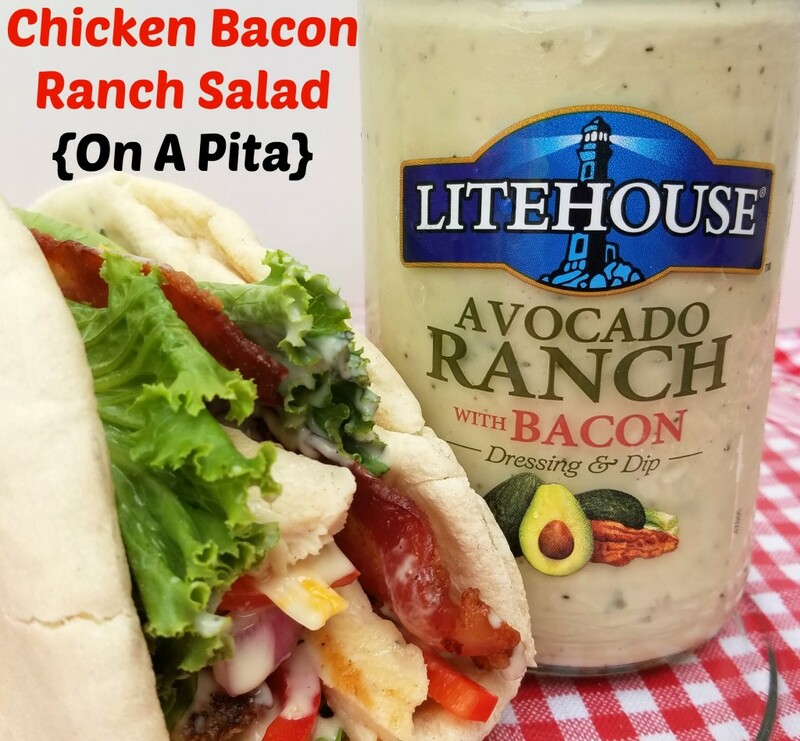 I love this one flavored with avocados and real bacon. They also have Homestyle Ranch and Jalapeno Ranch flavored dressings. You can find Litehouse products in the refrigerated produce section of your local supermarket. What is your favorite lunch recipe? 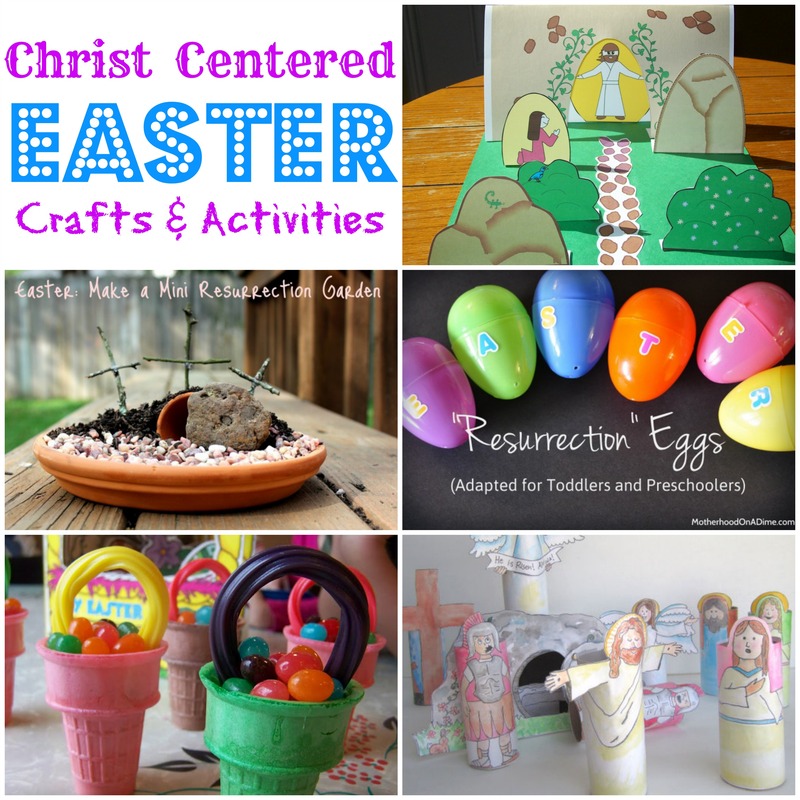 I’d love for you to share in the comments below since I can always use more ideas! 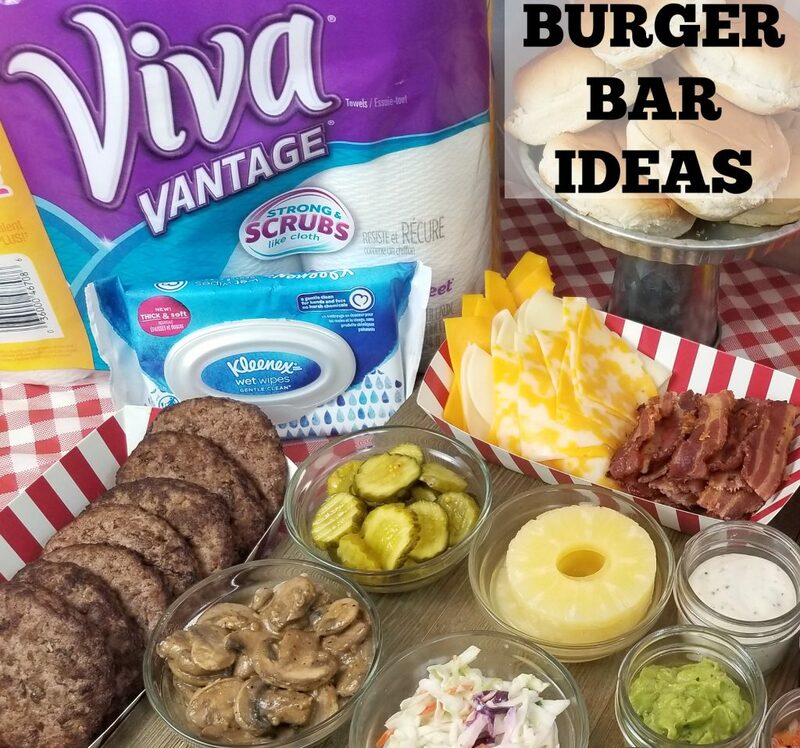 In preparation for back-to-school I decided to come up with some new after school snack ideas. I wanted to make something that we could easily bring with us to afternoon sports and activities. Since Lucas loves Goldfish® crackers so much I wanted to incorporate them into a snack mix and, with fall around the corner, I thought it would be fun to make a fall harvest themed one. I used two varieties of Goldfish crackers- the Mix (which includes Xtra Cheddar and Pretzel Goldfish crackers) and the Original Cheddar flavor. Along with Goldfish crackers I included a handful of other items that reminded me of fall. Since apple picking is a favorite Autumn activity I added some dried apples into the mix, along with raisins and dried cranberries. For a sweet touch, I also added in orange, yellow, red and brown chocolate candies and a bit of sprinkles in little leaf shapes. To add an extra crunch I included some plain popcorn in the mix. To make the snack mix just add each ingredient to your bowl and then stir it together! Lucas loved the mix I had created and I love that I found a fun snack that he and Jacob can enjoy all year long. There is nothing better than seeing my kids smile with joy over something I’ve created for them! Another simple snack the kids enjoy is Goldfish crackers paired with fresh fruit. Their favorites are grapes and strawberries and personally I like to pair mine with apple slices. 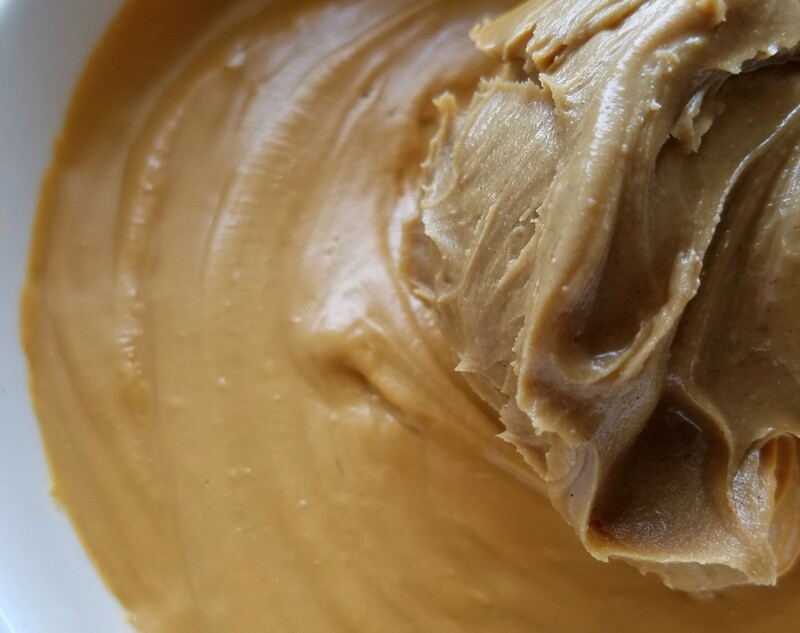 It’s such a simple snack the whole family can enjoy. Bulk boxes of Goldfish crackers are on rollback now for $5.98 at Walmart! I love that I can buy them in bulk because they are a staple in our house! You can also save $1.00 on any ONE (1) Bolthouse Farms® 10 oz. Baby Carrots or Bolthouse Farms(® 11 oz. juice when you buy any ONE (1) Pepperidge Farm® Goldfish® crackers 30 oz. or larger. Which Goldfish crackers variety is your favorite? Dinner time is usually rushed during the busy sports seasons of spring and fall so I need to find delicious options that are quick and easy to make. Soup is something both of my boys will eat and something Jacob really loves. My favorite soup brand is Campbell’s because it reminds me of my childhood, and the boys were really excited to see Dory, and her friend Nemo, from Disney Pixar’s Finding Dory on the soup can at our local Target store. The can is full of fun-shaped pasta (sea shell, Dory, and Destiny) in chicken broth. Luke’s favorite snack, Goldfish® crackers, also have our favorite fish characters on their Goldfish® Special Edition! Cheddar Disney Pixar’s Finding Dory Crackers packaging with special edition colors (colors sourced from plants). Together, with some fresh fruit, these make a great kid-friendly meal I can make within minutes. To celebrate the new Disney Pixar’s Finding Dory branded packages, the boys and I made fun fish shaped placemats for our table. They are easy to clean so any dribbles of soup or crumbs can be wiped off. 2) Peel a portion of contact paper from it’s backing and lay it sticky side up you’ll want the exposed piece to be a little bigger than a typically sized placemat. Note: Do not cut the contact paper from it’s roll. 3) Put pieces of tissue paper on the contact paper. Your children can make patterns or put them on randomly and they can overlap. Repeat until the majority of the contact paper piece is covered by tissue paper pieces. 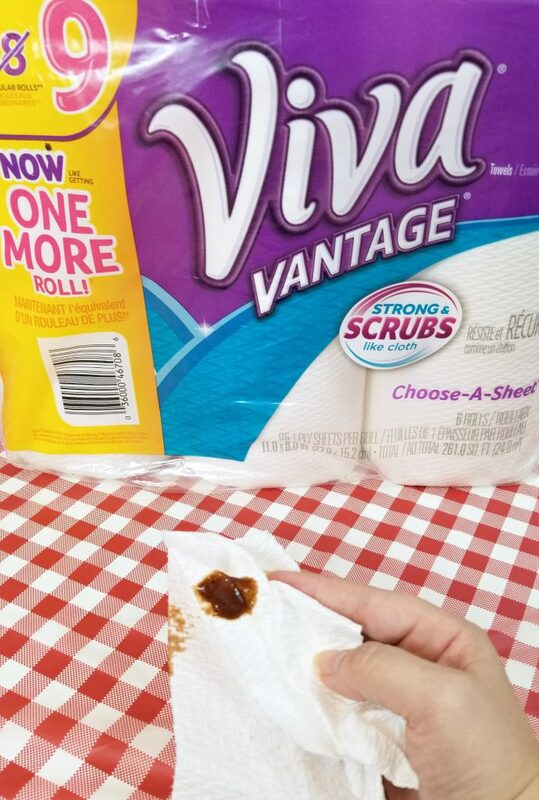 4) Carefully peel the contact paper back more and fold the contact paper over so you are covering the tissue paper with the sticky contact paper you just exposed. Go slowly, smoothing the contact paper as you go so that there are no bumps or air bubbles and that the contact paper matches up with the other piece you put the tissue paper on. You can find both the special edition Disney/Pixar’s Finding Dory branded Campbell’s soup and the Goldfish® Special Edition! Cheddar Disney Pixar’s Finding Dory Crackers at Target. They had a special display at the end of one of the frozen food aisles. What’s your favorite go-to dinner that’s easy to make? I was challenged by Nature’s Harvest bread to come up with a Finding Dory themed sandwich recipe to share with my readers in this sponsored post. Disney – Pixar’s “Finding Dory” is almost out in theaters! Are your kids as excited as mine? I wanted to add a little Dory fun into our typical chicken salad recipe so Sinisa and I created this amazing blueberry chicken salad recipe. Typically, if chicken salad has fruit in it, it’s either grapes or apples but I figured why not add some blueberries instead to celebrate the movie coming to theaters since Dory is blue! I love the mix of flavors that this sandwich has. This chicken salad is easy to make! Select packages of specially-marked Nature’s Harvest® bread will feature the lovable characters from Disney• Pixar’s “Finding Dory,” which hits theaters this Friday. For kid’s sandwiches you can use a cookie cutter to cut out a fish, whale or seashell from the bread before you put the chicken salad on the bread. Serve with goldfish crackers for a fun lunch! Want even more Finding Dory fun? 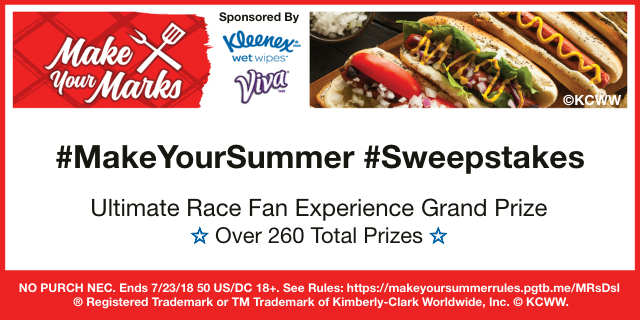 Nature’s Harvest® bread is hosting the Make A Splash with Whole Grains Sweepstakes on its Facebook page now through July 7th, where fans can enter for a chance to win weekly prizes, including movie tickets, autographed posters and more. No purchase necessary. See official rules here. Have you ever added blueberries to your chicken salad? If not, would you try it? One of our favorite restaurants to eat at in the Summer is the Hard Rock Cafe in Chicago. I love the outdoor patio and the atmosphere of the restaurant and so does my family! 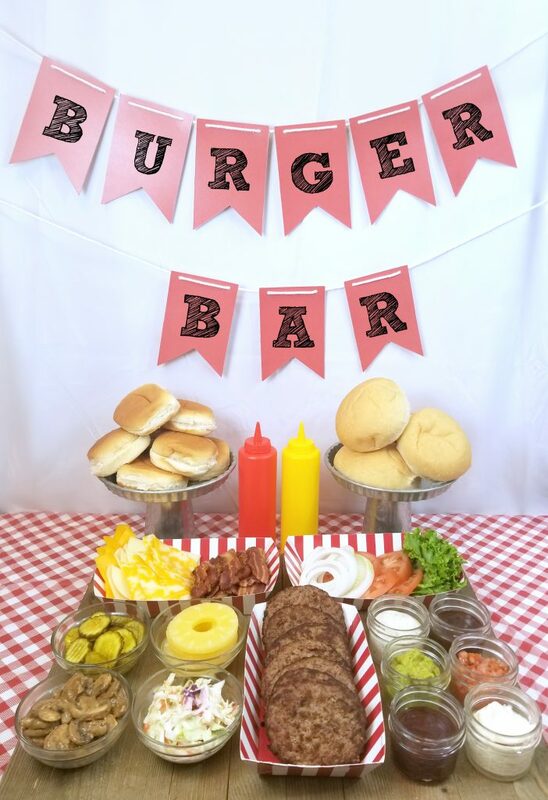 I worked with them a couple years ago to share about a new kid’s program they had and I’m happy to be partnering with Hard Rock Cafe again this year to share about their new World Burger Tour. 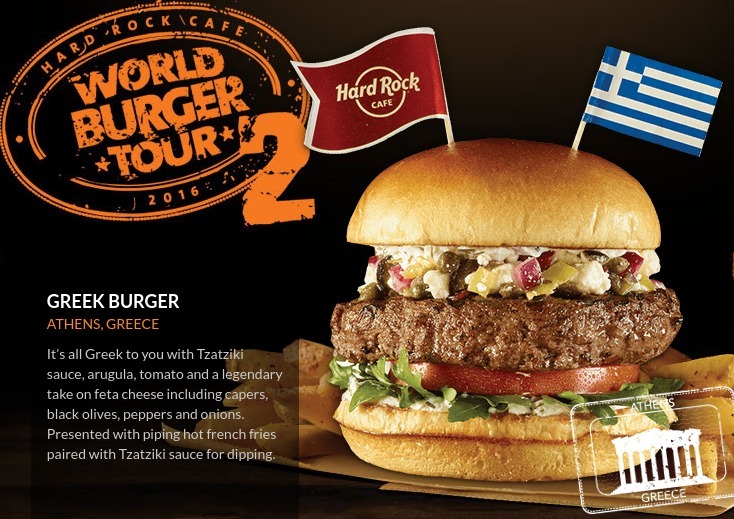 This Summer, Hard Rock Cafe locations in North America are celebrating the start of burger season with their Hard Rock World Burger Tour, a menu showcasing international Local Legendary™ Burgers. The limited-time World Burger Tour menu is available through Thursday, June 30, 2016. English Breakfast Burger (London, England) – a Certified Angus Beef® patty topped with sliced ham, a sausage patty, a fried egg, a portobello mushroom, arugula and garlic aioli and served with a side of baked beans. Java Lava Burger (Seattle, United States) – a Certified Angus Beef patty grilled and dressed in a house-made espresso rub and topped with lava sauce, crunchy java onions, bacon, melted Cheddar cheese and garnished with a fried jalapeño. Jamaican Jerk Burger (Montego Bay, Jamaica) – a Certified Angus Beef patty topped with banana pepper rings, mango jalapeño cream cheese and jerk mayonnaise. ATOMIC! Burger (Las Vegas, United States) – a Certified Angus Beef patty topped with Atomic beer-battered peppers, pepper jack cheese, caramelized onions, sautéed mushrooms, garlic chipotle ketchup and chipotle mayonnaise. Tango Salsa Burger (Buenos Aires, Argentina) – a Certified Angus Beef patty topped with andouille sausage, Monterey Jack cheese, chips de batata, a fried egg, salsa criolla and garlic aioli. Greek Burger (Athens, Greece) – a Certified Angus Beef patty topped with arugula, feta cheese and a tomato slice. 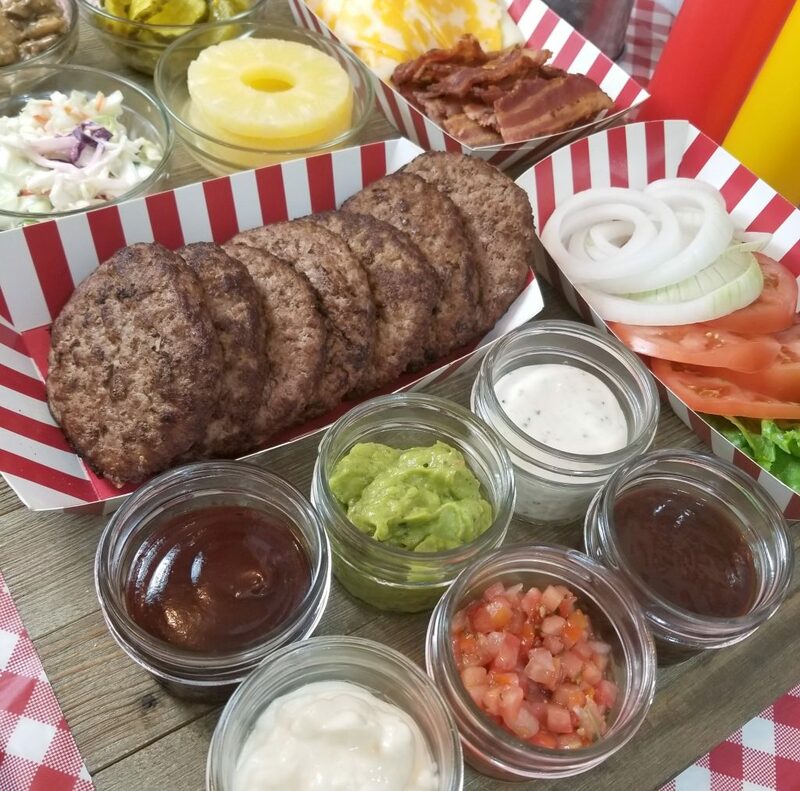 Aloha Burger (Honolulu, United States) – a Certified Angus Beef patty topped with Portuguese sausage, Monterey Jack cheese, a grilled pineapple ring with sweet soy glaze, guacamole, pico de gallo, served with Furikake french fries. All Jacked Up – created to balance the Jamaican Jerk Burger’s spicy flair, this cocktail features a mix of Jack Daniel’s Tennessee Honey, Jack Daniel’s Tennessee Whiskey, Sailor Jerry Spiced Rum, PJ, Orgeat and lime juice, garnished with orange and pineapple wedges and a cherry. Crisp Sipper – inspired by the Aloha Burger’s sweet and savory taste, this cocktail features a mix of Hendrick’s gin, Monin Cucumber, lemon, orange and raspberry, topped with tonic and garnished with rosemary and thyme. MelonPalooza – designed to complement the fresh flavors of the Greek Burger, this cocktail features a mix of Midori Melon Liqueur, Malibu Rum, Hard Rock’s house-made sour mix and PJ, garnished with slices of pineapple and strawberry. Sweet & Fiery – inspired by the ATOMIC! Burger’s spicy flavor, this cocktail features a mix of Absolut Peppar Vodka, Canton Ginger Liquor, Blue Curacao, lemonade and ginger beer, garnished with a red pepper. Black Cherry Melonade (non-alcoholic) – created to complement the rich espresso of the Java Lava Burger, this mocktail features a mix of Black Cherry Real and Monin Cucumber, topped with ginger beer, garnished with a cucumber slice and a cherry. Thanks to IHOP for providing a gift card to sample their new Summer Stacks. One of the things on our bucket list this summer was breakfast for dinner so we headed to our local IHOP restaurant to enjoy the special meal. While french toast and bacon are my ideal breakfast meal, Sinisa is all about crepes and the boys love their pancakes. IHOP has something for us all! This summer, IHOP is inviting guests to savor the flavors of the season by offering three new signature pancakes. The three flavors are perfect for summertime- Blueberry Lemonade, Banana Pudding and Blackberry Peach Cobbler. Since we love to try new things our family ordered one of each. Blueberry Lemonade: Blueberry pancakes topped with lemonade cream and fresh blueberries. Banana Pudding: Buttermilk pancakes topped with silky banana pudding, sliced fresh bananas, whipped topping, powdered sugar and Nilla® wafers. Blackberry Peach Cobbler: Buttermilk pancakes topped with juicy blackberries, sweet peaches, crunchy honey oat pecan crumbles and a scoop of vanilla ice cream. The boys loved the Banana Pudding ones the most. My favorite flavor were the Blueberry Lemonade ones. They were the perfect amount of sweet and tangy. The Blackberry Peach Cobbler ones were good as well- I liked the crumble on them, my mom thought the peaches were delicious. and the ice cream on them was a hit with the kids. Some restaurants offer short stacks of these special pancakes but others, like our local restaurant, serve them as part of a combination plate, with two eggs, hash browns and a choice of crispy bacon, pork sausage links or grilled ham slices. Want to try one of these new flavors yourself? Hurry because Summer Stacks are available at participating IHOP restaurants only through July 26th. One of my favorite things to do during the holidays is bake cookies with my family. I tend to make the same cookies year after year but this year I wanted to make some new varieties. 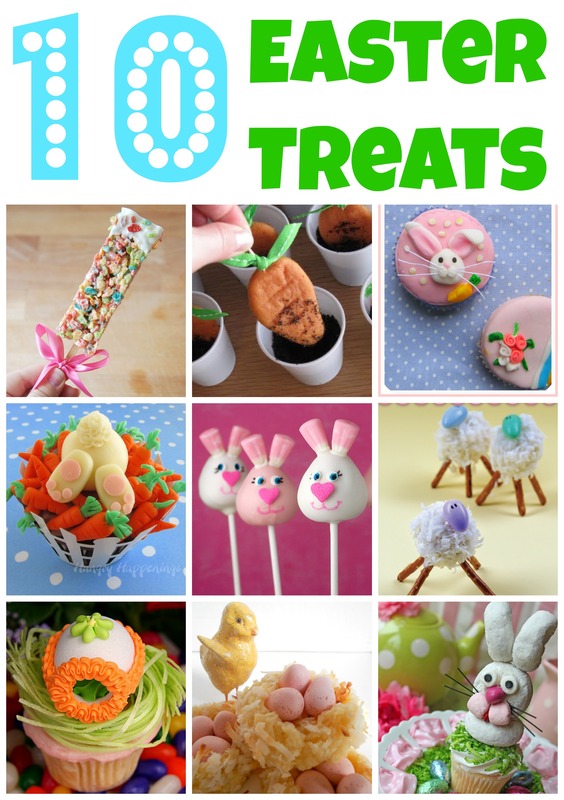 I headed to Pinterest to see what I could find and wanted to share 10 of my favorites with you all! One of these will be in the oven on Christmas Eve but I’m still deciding on which one I want to bake. I love being able to bring my tablet into the kitchen and follow recipe directions on it. I used to have to print out the recipe or write it down but now I can skip that step. Some websites even provide quick video tutorials and I can watch them while following the step by step directions as I watch. I like the crisp, clear images and the videos load really fast on my tablet all because of the Intel processor that’s inside of it. In fact, Intel Tablets have 1.9x better web performance than other tablets which means I can spend less time searching the web and more time baking this holiday season! #spon: I’m one of the #SaveALotInsiders and am required to disclose a relationship between our site and Save-A-Lot. This could include Save-A-Lot providing us w/content, product, access or other forms of payment. Holiday dinners are some of the best meals of the year. They can also be some of the priciest. In an effort to save a bit of money I headed to Save-A-Lot to fill up my cart and create a simple holiday meal for less than $25. One of the side dishes I love during the holidays is sweet potatoes. They can be made fresh but when I’m short on time I use candied yams that come in a delicious syrup. I add marshmallows on top and then bake until the marshmallows are slightly toasted. It is so easy and everyone loves them! To complete our holiday meal we had ham and freshly baked rolls. All the ingredients (including half a ham which gave us leftovers for days) was less than $25! 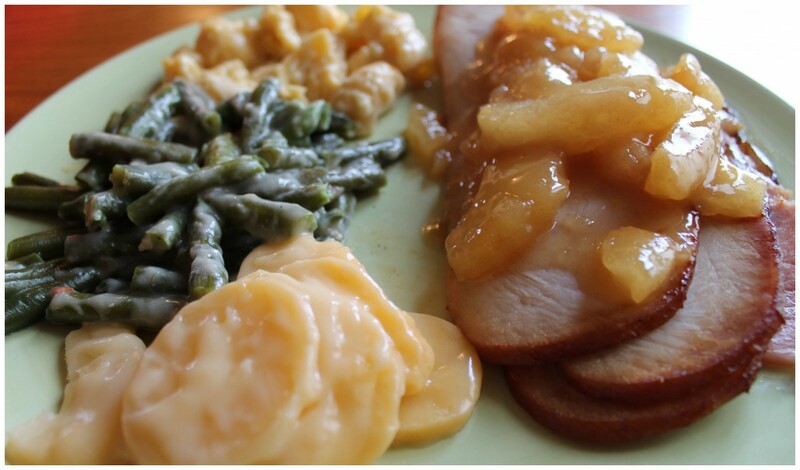 What is your favorite side dish during the holidays? For the chance to win a $25 Save-A-Lot gift card, check out the Smart Shopper Sweepstakes on the Save-A-Lot Facebook page: www.facebook.com/SaveALot. For many families, Christmas dinner wouldn’t be complete without ham. In my family this hasn’t always been the case. See, I actually used to believe that I didn’t like ham because I had grown up eating salty ham. Enter HoneyBaked ham with their sweet, crunchy outsides and I discovered a couple years ago that I actually love ham. It just has to be the right kind of ham! I ate leftovers of this ham for days, most of the time just picking pieces out of the bag in the fridge because I couldn’t wait for it to hit my plate. 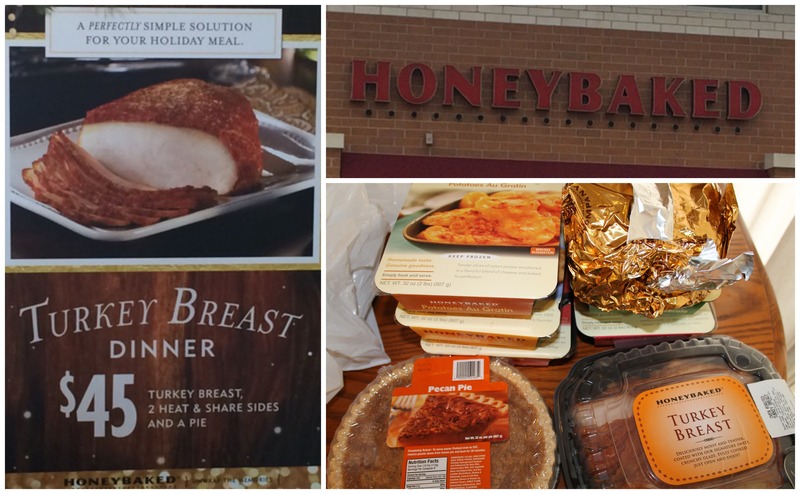 HoneyBaked Ham has such a great selection of items to complete your Christmas meal, from meat to sides to dessert. With picky eaters and a different taste buds this variety is important. Macaroni and cheese was a big hit with the kids and the adults enjoyed a little of everything. Once dinner was over it was time for dessert. The kids were so excited to see the dessert tray they got to choose from. There were cookies, chocolate brownies and cheesecake slices. Donate $1.00 to Feeding America during checkout at the register of any HoneyBaked store. $1.00=10 Meals! This summer I had the privilege of attending the School Nutrition Association’s National School Lunch Conference on behalf of the SNA. I wrote about everything I learned here. I was amazed by how much school lunches have changed since I was in school. I am happy to partner with them to share this post. The School Nutrition Association has a great website called Tray Talk that was created for parents to get the facts about school meals. Parents can get answers about the nutritional values of lunches, how school nutrition programs are working to make healthy meals kid-friendly, learn more about how special dietary needs are handled and a variety of other questions. Review cafeteria menus with your child and encourage them to try new menu items. Prepare new foods – especially fruits and vegetables – at home and your child may be more willing to try these foods at school. Visit the school cafeteria to make your own observations and have lunch. Check with the principal first to make sure that is allowed! Inquire about volunteer opportunities in your school cafeteria. Some schools request parent volunteers to help usher students through the lunch line and encourage them to eat their fruits and vegetables. Many school districts have a wellness committee comprised of community volunteers, to help establish district nutrition and physical activity policies. I also loved reading about the success stories that other schools have shared. It’s fun seeing what other districts are doing to get their children excited about eating healthy meals. I wish they had things like cooking contests, spinach-strawberry salads, and farm tours to see how food was grown when I was younger! Want to learn more? Check out Tray Table on Facebook! This has been a busy season so far, with football taking up four to five days a week. Every Tuesday, Thursday and Friday night the boys come home from school, we do a bit of homework, Jacob changes into his practice gear, we grab water and snacks, and then we are out of the house within the hour. Those days are hectic and we don’t get a chance to eat dinner before we leave so we pack snacks to enjoy once we get to the field. I try to pack healthier options but it’s not always easy do do when we are running out the door. Recently I figured out that if I packed snack ahead of time it was really easy to bring something with so I wasn’t tempted to grab something unhealthy. 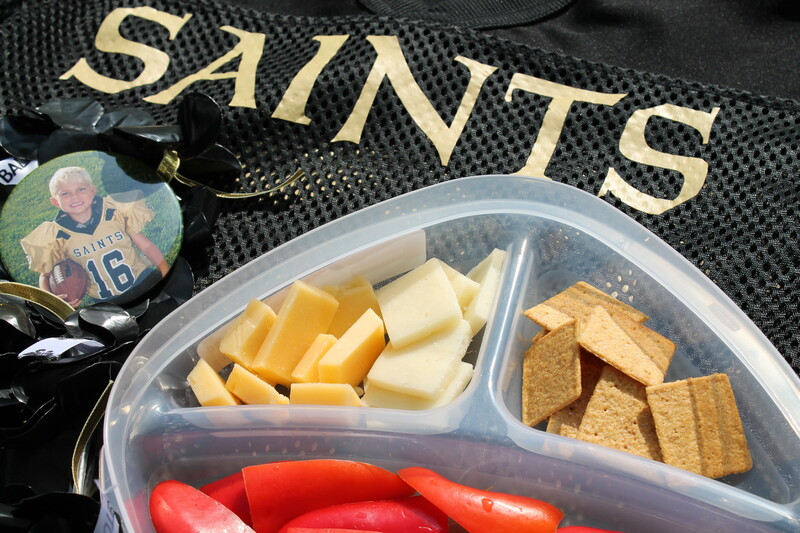 What’s great about the most recent snack platter we brought to football practice was that it’s portable, easy to put together, and the kids can help! I headed to my local grocery store, Jewel, and bought a divided plastic container, two varieties of Arla Dofino cheeses, wheat crackers and a pack of mini-peppers. I also bought some bottled water since I’m trying to kick my iced coffee and soda habit. I cut the peppers and the cheese. The boys helped me take the seeds out of the peppers and then put the cheese and peppers into the container to keep in the fridge. Right before leaving for practice we put the crackers into the container and grabbed a few bottles of water. While sitting waiting for practice to start we enjoyed eating the snack and chatted about the school day. The boys loved the snack and so did I. I thought it was filling and would get them through practice until we could have dinner at home. No more unhealthy snacks for football practice! I discovered Havarti cheese a couple months back and it quickly became my favorite variety of cheese. I hadn’t had Gouda cheese in a while but I realized that I liked that as well. I enjoyed the Havarti with the crackers and paired the Gouda with the red peppers. Looking for Arla Dofino cheese near you? Here’s the store locator. There’s also a sweepstakes going on until 10/4. Like the Arla Dofino Facebook page and enter for your chance to win a semester’s worth of cheese! Find Arla Dofino on Pinterest, too. 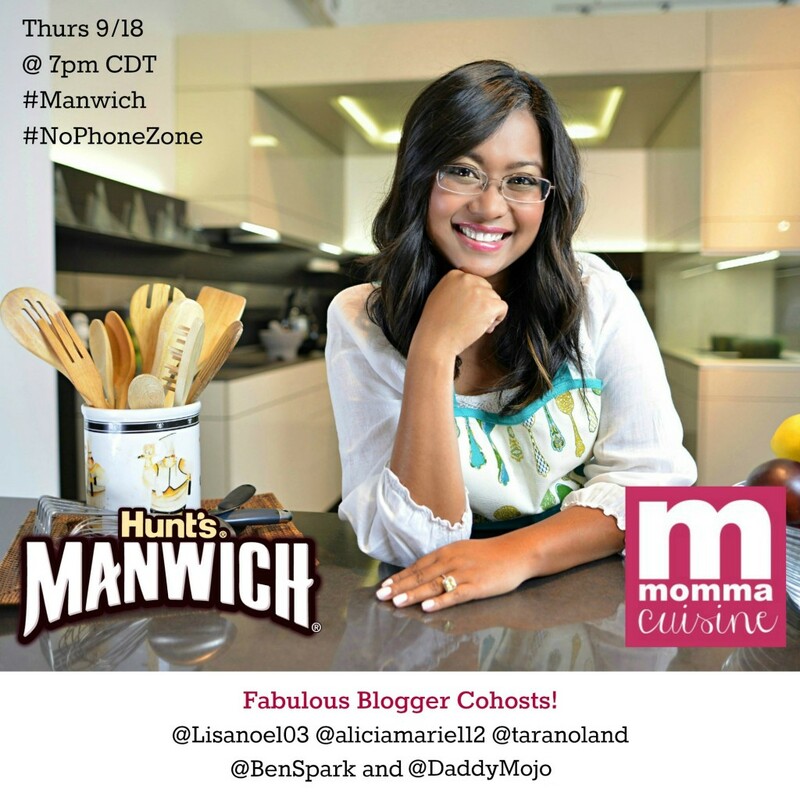 I’m excited to be co-hosting the #Manwich #NoPhoneZone Twitter party promoting phone-free family time around the dinner table. The party is this Thursday, September 19th, at 7pm CST and is hosted by Johanna of Momma Cuisine, along with co-hosts Lisa, Tara, Ben, Trey and I. What did you have for lunch today? Nothing? Your kid’s leftovers? A sandwich? Do you even remember? Occasionally I have something small or leftovers but normally I have nothing so I was really excited to partner with Applebee’s on a recent campaign. They gave me some gift cards to go out to lunch with my loved ones and have a memorable meal. 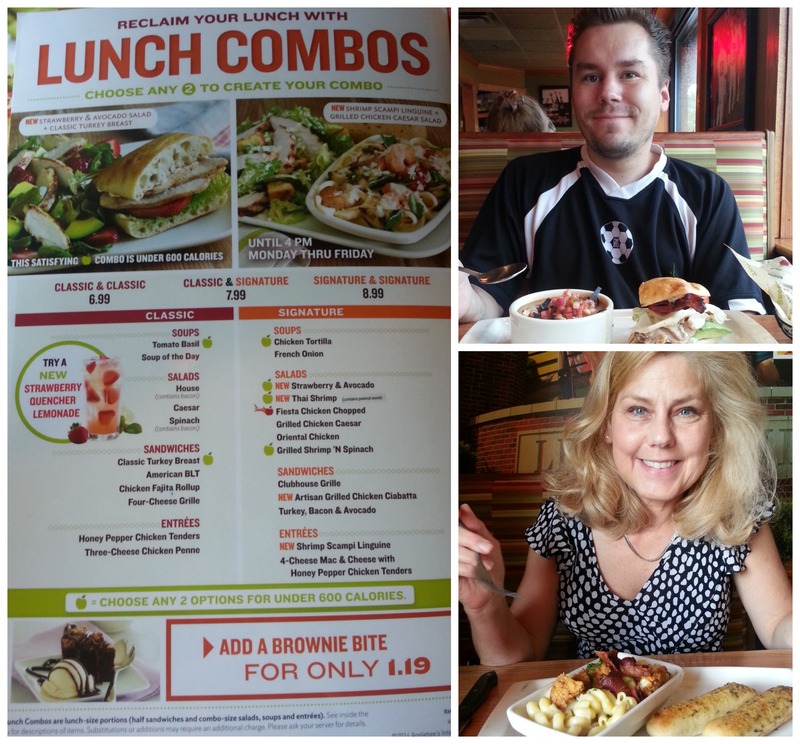 With over more than 200 lunch combos, ranging in price from $6.99 to $8.99, there was lots to try! I loved almost everything I ate. My favorite was the Grilled Shrimp N’ Spinach Salad. Not sure what the dressing was but I thought about this salad for days after I had it and had to go back and get it again when I took my sister out to dinner a week later. Sinisa’s favorite was the Artisan Grilled Chicken Chiabata Sandwich and also the Tortilla Soup. The prices are so great that if you still have room for dessert you can afford to order it. What would you choose from the great lunch menu at Applebee’s?